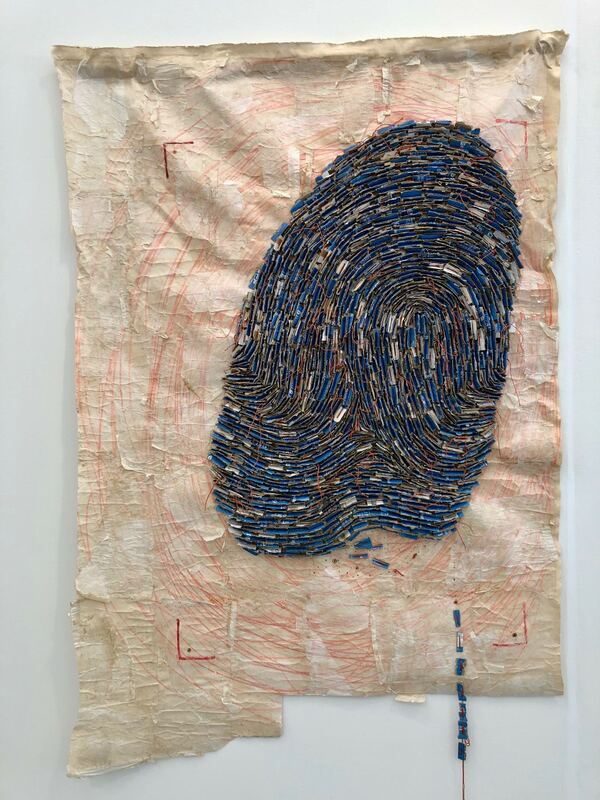 Wallen Mapondera, “Deliberate Impressions”, 2018, cardboard, wax paper, waxed cotton thread and ink on canvas at Tyburn Gallery, London. Zimbabwean artist, Wallen Mapondera creates complex wall sculptures with richly tessellated abstract surfaces out of cardboard and textiles. 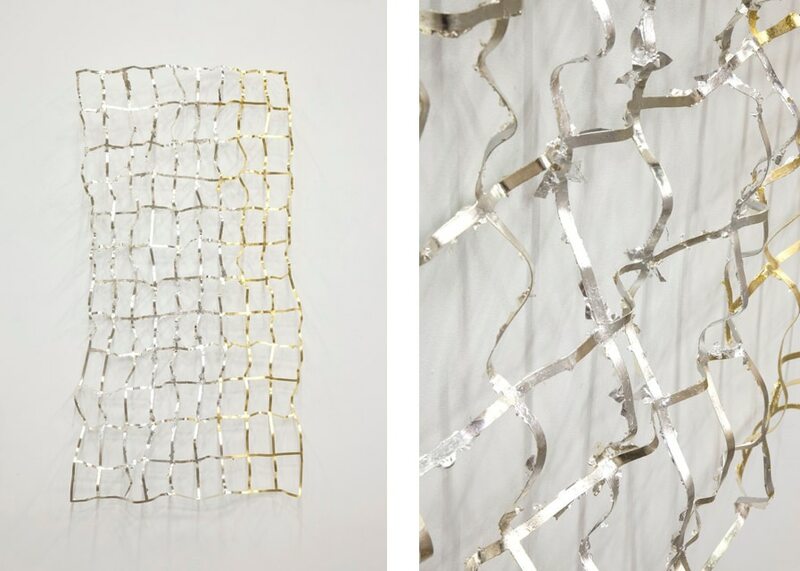 These works challenge the linearity of time and history, transforming ordinary materials into textured visual puzzles. Noémie Goudal, “Telluris VIII”, 2017, C-print mounted on aluminum, 45″ x 57″. at Galerie Les Filles du Calvaire. Noémie Goudal’s practice is an investigation into photographs and films as dialectical images. Close proximities of truth and fiction, real and imagined offer new perspectives into the photographic canvas. The artist questions the potential of the image as a whole, reconstructing its layers and possibilities of extension through sculptural installations she then photographs. 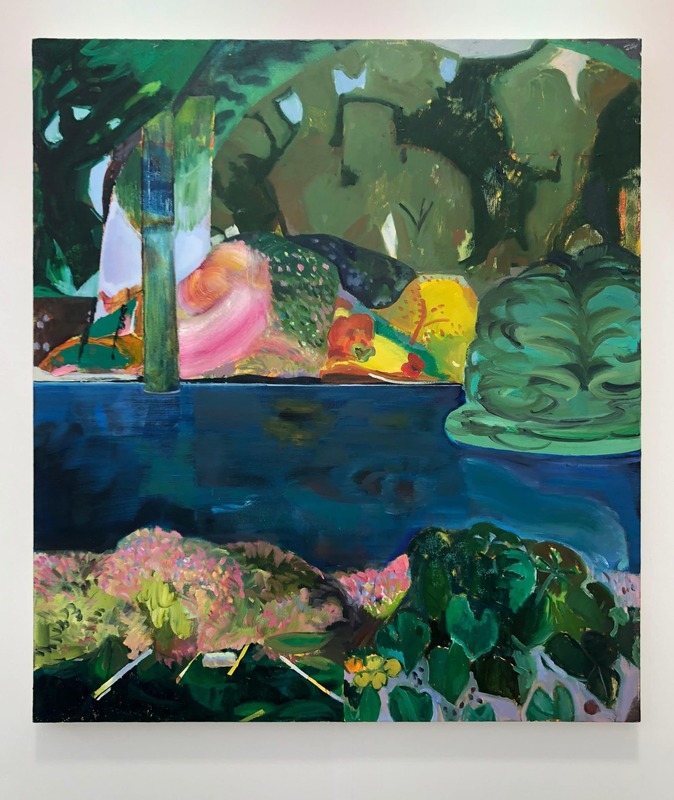 Monica Tap “Charles’ Tree”, 2018, oil on canvas, 46″ x 41″ at MKG127, Toronto. Monica Tap uses landscape to consider questions of time and history, technology and memory. Her paintings are arrangements assembled from various fragments: outtakes from favorite paintings in history, elements from her own snapshots, color notes, and memory. Each painting is both an invention and a response to place that she knows and has recorded. 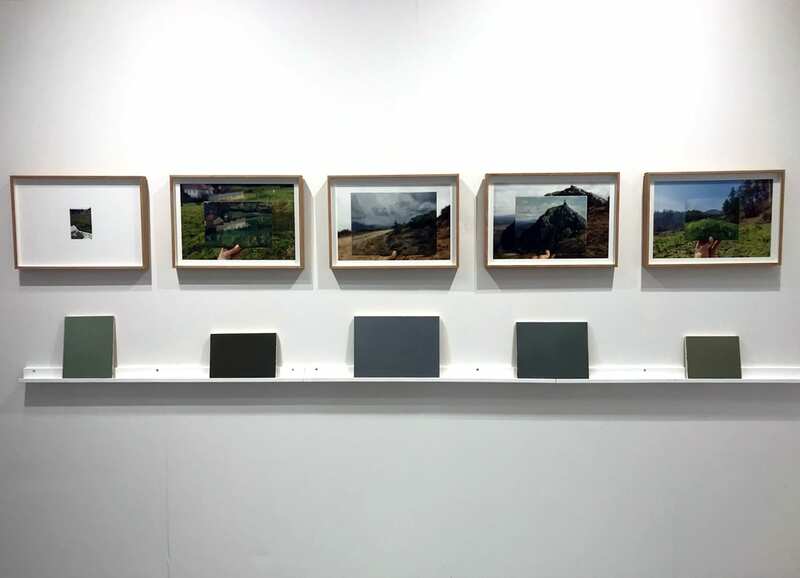 She is interested in how location or landscape can trigger memory; akin to how painting readily conjures its own past. 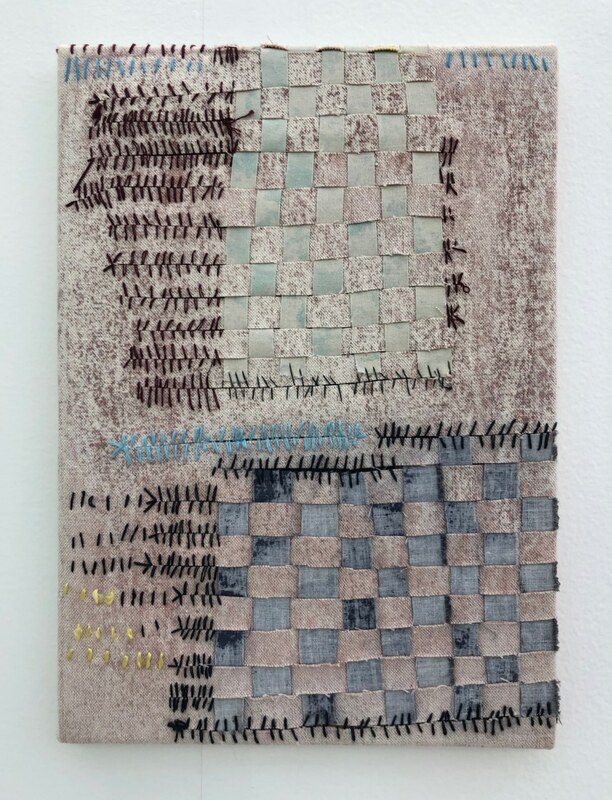 Teresa Lanceta, “Años Despues”, 1997, sewn and woven linen at Galeria Espacio Minimo, Madrid. These small pieces by weaver Teresa Lanceta are much more informal than her larger works, showing her hand in stitching embellishments. 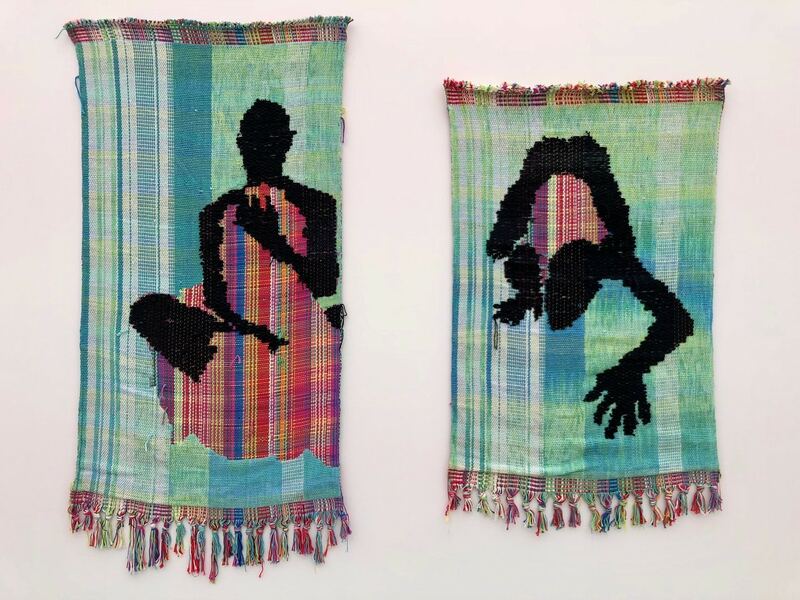 Her approach to weaving focuses on the formal elements, on the original, inherent aspects of woven fabric: its ligaments, materials, traditions and techniques. For Lanceta, weaving is just another part of daily life that allows personal stories, events and experiences to impregnate the warp and weft of their creations. 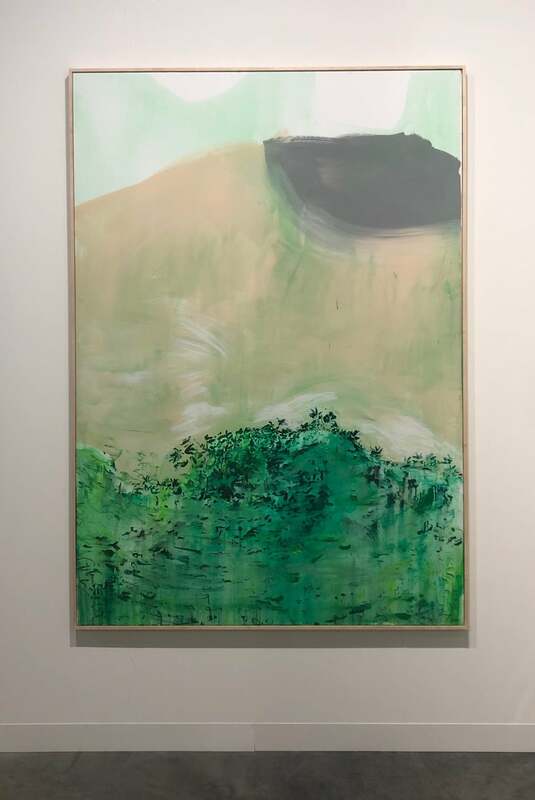 David Lloyd, “Untitled” (3), 2018, mixed media on paper at Klowden Mann, Los Angeles. These small paintings on paper by David Lloyd incorporate a wide range of media in pursuit of his conceptual goals. He employs a variety of methods ranging from collage, fiberglass and resin, monoprint, paint of a variety of kind and xerox transfer. Ranti Bam, terracotta vessel and wall sculptures at 50 Golborne, London. London based artist, Ranti Bam’s work explores the potential of ceramic to express a love of words and metaphor. Her process involves working with clay in its natural unreinforced state, using slip to embellish the surface with colors, patterns, texts and textures. With inspiration drawn from wood, metal and fabric, she combines hand building and throwing, continually deconstructing and abstracting her pieces, creating form through collage. 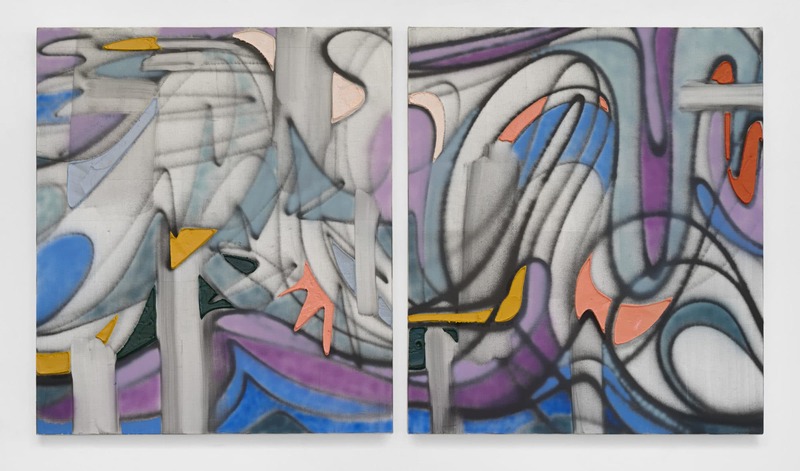 Nathlie Provosty, “Closed Eye Vision (Right)”, 2018, oil on linen diptych, 96″ x 53″ at Nathalie Karg Gallery, New York. Provosty’s work is engaged with consciousness and perception. 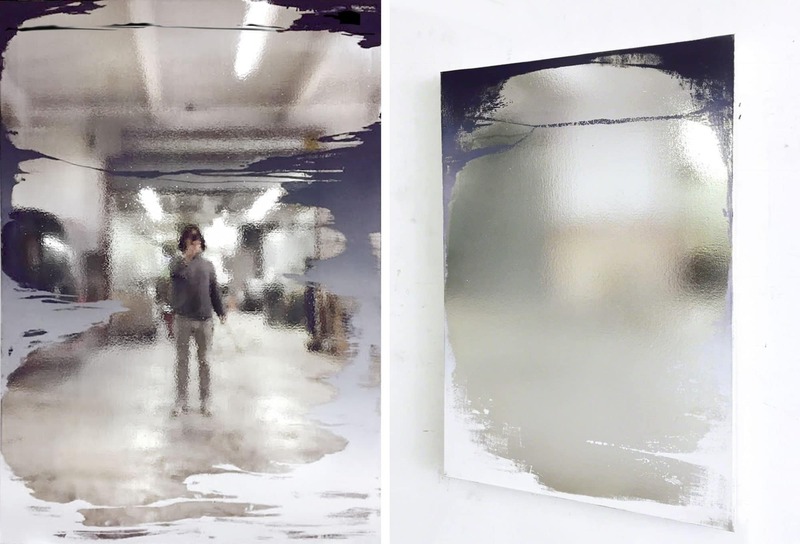 The artist uses subtle, highly material qualities of oil paint which oscillate visually and conceptually by way of multi-referential imagery, a physical interaction with light and the environment, and continuous spacial shifts. Martin Boyce, “Untitled”, 2017, painted perforated steel, aluminum, and painted steel chain at The Modern Institute, Glasgow. Martin Boyce’s sculptures, photographs and installations poetically investigate the intersections between art, architecture, design, and nature. 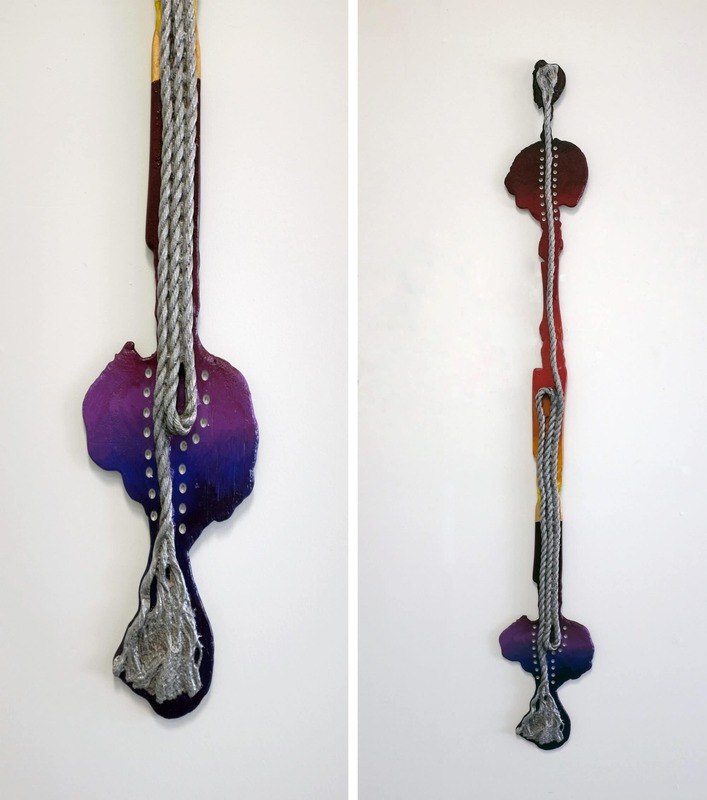 He incorporates a palette of shapes and forms that frequently recall familiar structures from the built environment, for example a painted steel chain, yet presents them in a way that is entirely new. 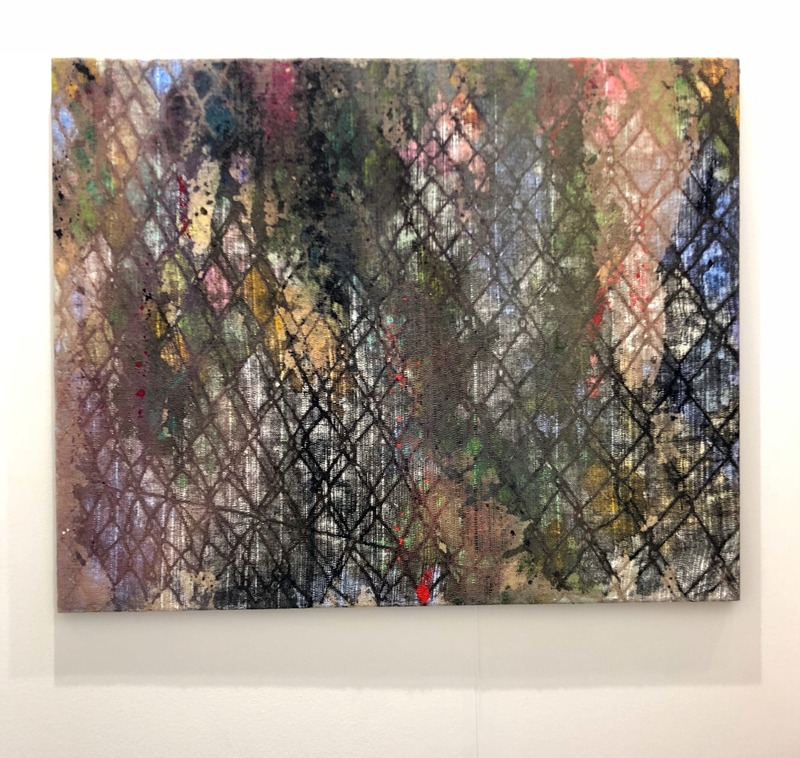 Ida Tursic and Wilfried Mille, “The Comete”, 2018, oil on canvas, 78″ x 118″ at Alfonso Artiaco, Napoli. Since they began collaborating as a duo in 2000, Ida Tursic and Wilfried Mille have been interrogating the contemporary overload of images and their relation with pictorial representation, questioning their reproduction, circulation and disappearance. Taken out of movies, magazines, media and the enormous repertory of data available on the internet, this boundless source of anonymous, preexisting material is used up and transformed into paintings. 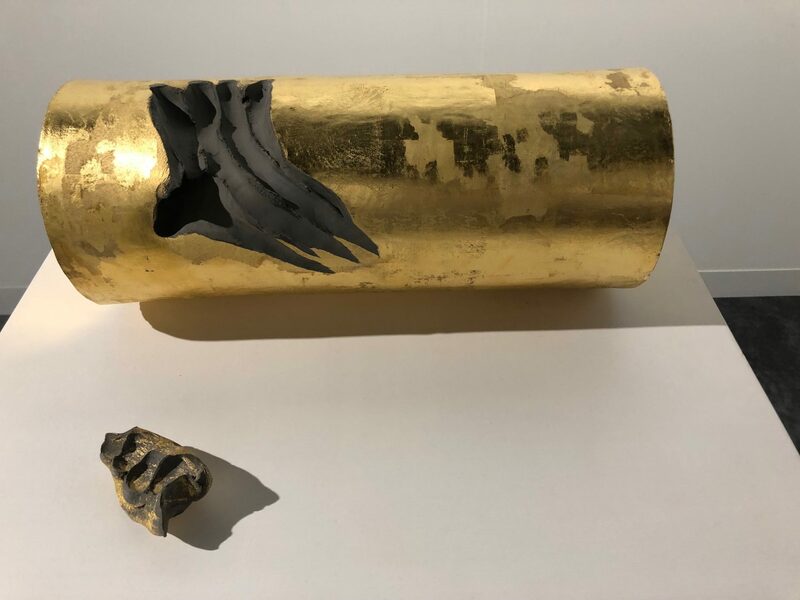 Michel Francois, “A L’arraché”, 2018, clay and gold leaf at Alfonso Artiaco, Napoli. Always a favorite, Michel Francois work’s accumulate over time and vary according to their disposition in space, or the context. In a manner similar to that of the Arte Povera artists, François uses great economy of means to transform seemingly uncomplicated objects and materials, or traces of past events, into deeply resonant carriers of meaning. 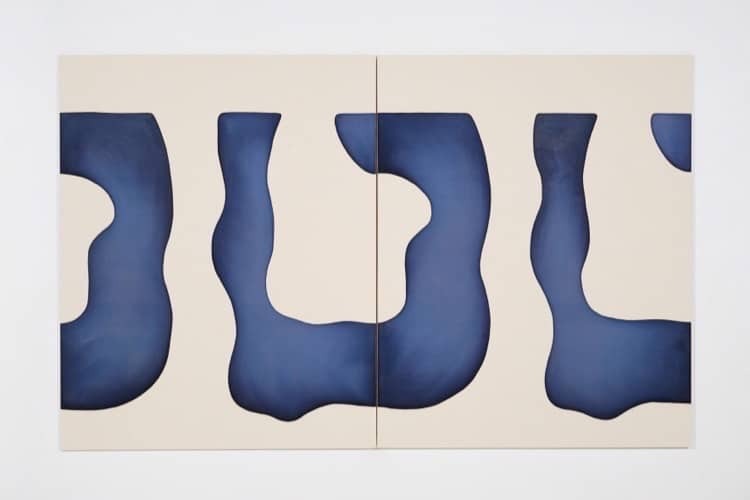 Antonio Ballester Moreno, series of acrylic on linen paintings, 2018 at Maisterravalbuena, Madrid. Antonio Ballester Moreno creates process-oriented works that materialize through the repetitive gesture of handcrafted geometries in symbolic earth tones. 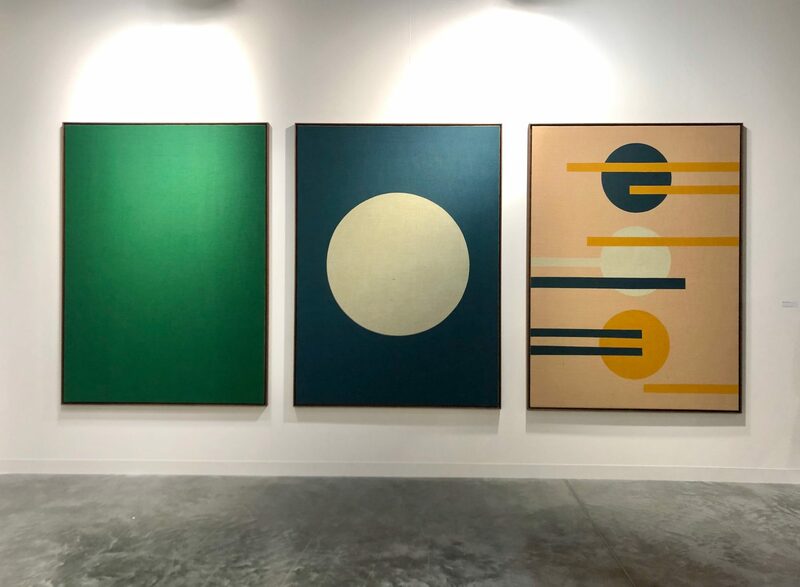 His aesthetic refers to shapes originating in nature, conveyed in a basic metaphoric language: yellow for light; blue to represent water; and the mixing of the two creates green, the color of vegetation; circles are cycles of the moon and sun; triangles are trees and mountains. Through his application of simplistic yet determined shapes and colors, Ballester Moreno has developed a personal vocabulary upon which he builds a world of subtle variances and symbolic compositions. While his approach is rooted in abstraction, his work evokes histories of pattern and decoration, craft, tapestry, design, and African, Islamic and Ottoman influences. 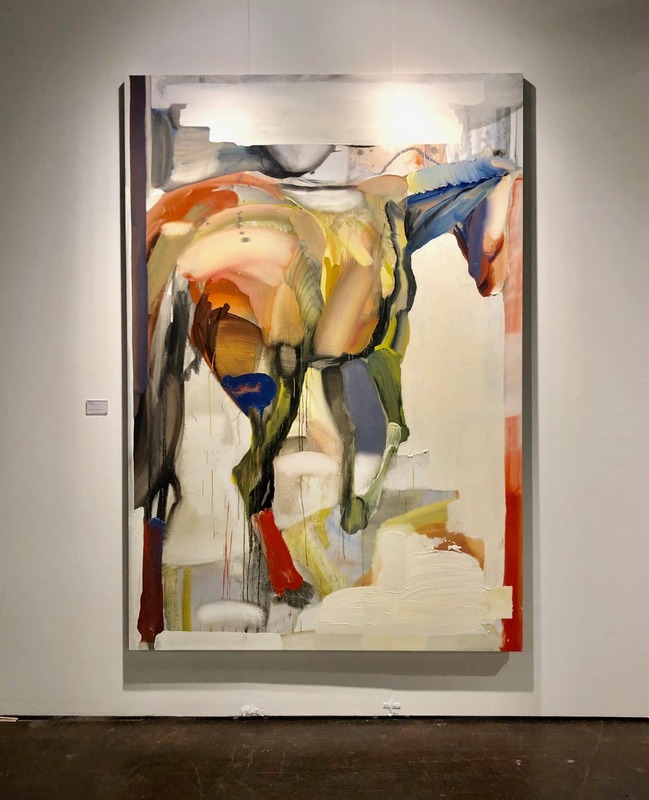 Julia Rommel, “Ex-Wife”, 2018, oil on linen, 90″ x 72″ x 2″ at STANDARD, Oslo. 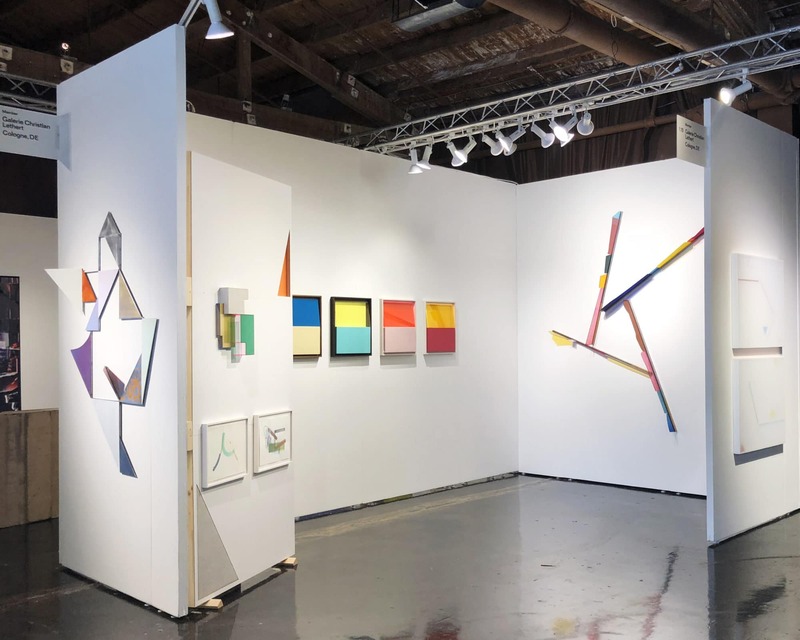 American artist, Julia Rommel uses canvases and stretchers as sculptural architecture for her work. She physically manipulates her canvases until arriving at a suitable intersection of composition and color fit for a convincing abstract painting. Rommel repetitively cycles through painting, stretching, painting, un-stretching at shifting scales and awkward angles. 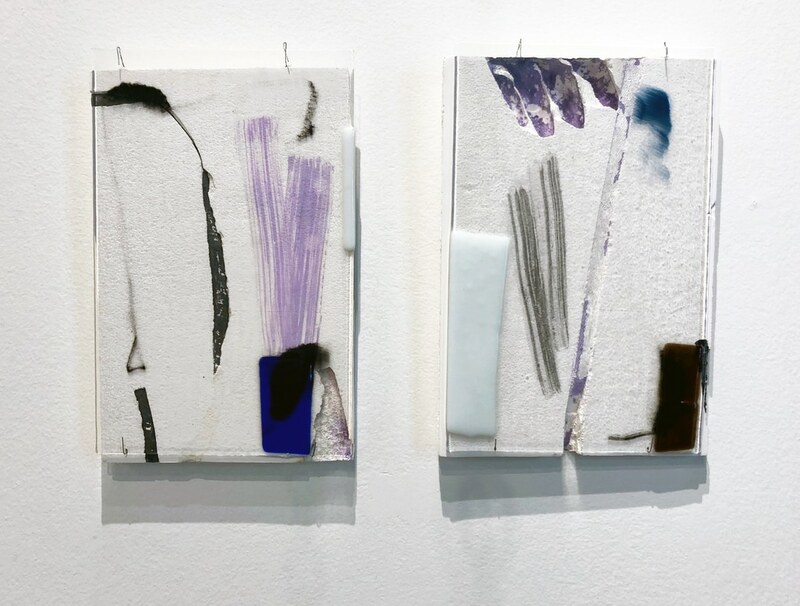 The results are color-blocked, stretched and re-stretched canvases where the physical process of the artist’s hand is documented through layering. 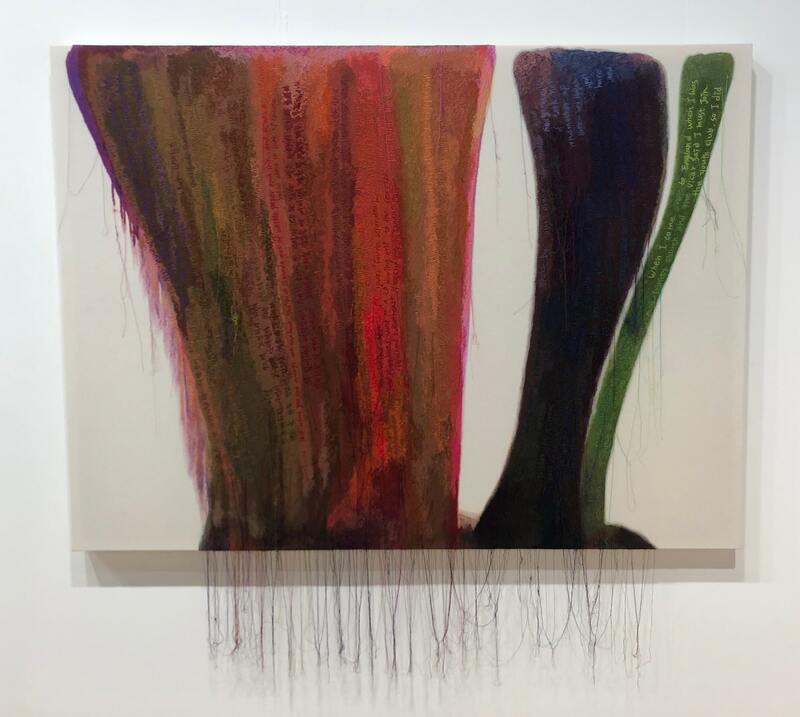 Kyungah Ham, “Abstract Weave/ Morris Louis Dalet Tzadik 1958″, 2014, machine embroidery on cotton, collected internet world news, tassel, wooden frame, 64.17″ x 65.75” at Kukje Gallery, Seoul. 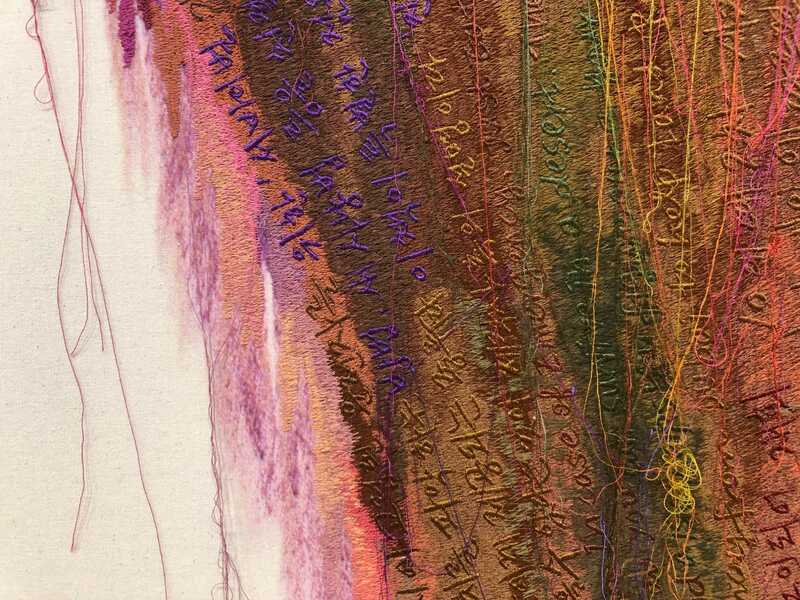 Ham is well known in Korea and internationally as an artist whose diverse practice investigates the political issues facing contemporary Korean society. She bravely confronts both memory and history and engages the subjects of nationhood and identity, framing larger questions of social value and progress with poetic works full of color and beauty. The work recalls a kind of postmodern narrative painting, mixing decorative and psychedelic imagery with lyrics from familiar songs and metaphoric language. Using appropriated images and texts, Ham re-contextualizes their histories to establish alternative interpretations of the value hierarchies that govern everyday life. The work blurs the personal and political. 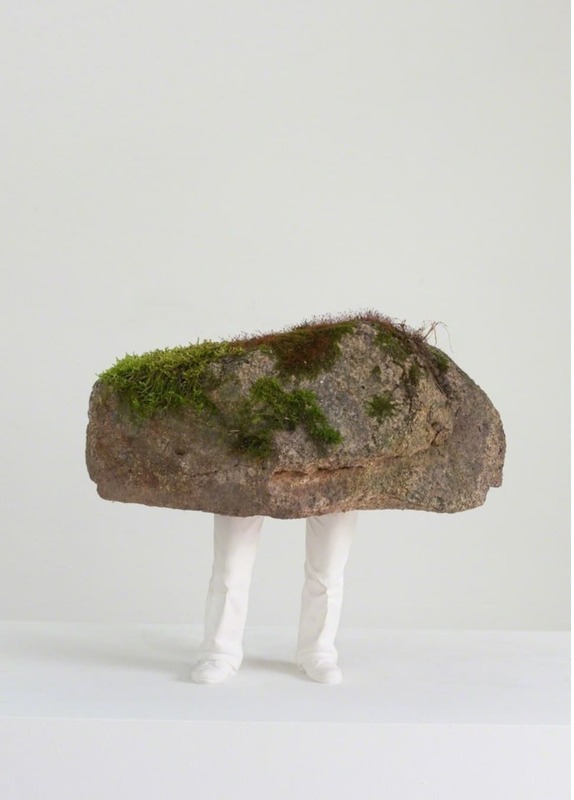 Erwin Wurm, “Stone”, 2018, acrystal and stone sculpture at Lehmann Maupin, New York. Austrian artist, Erwin Wurm explores the idea of the human body as sculpture. While Wurm considers humor an important tool in his work, there is always an underlying social critique of contemporary culture. Wurm emphasizes this dichotomy by working within the liminal space between high and low and merging genres to explore what he views as a farcical and invented reality. 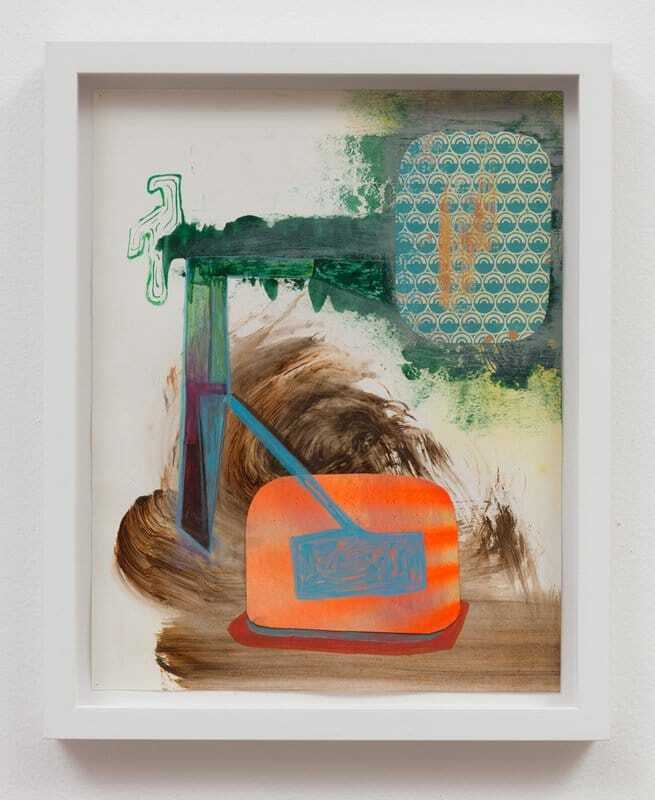 Brian Maguire, “Grow House”, 2014, acrylic on lines, 78 3/4″ x 55 1.8″ at Fergus McCaffrey, New York. Irish painter Brian Maguire, who now works in Juárez, Mexico, creates work in response to the proliferation of deaths that have followed in wake of the Mexican drug war. Maguire’s affinity for social activism stems from his involvement in the civil rights movement of Northern Ireland in the 70s. 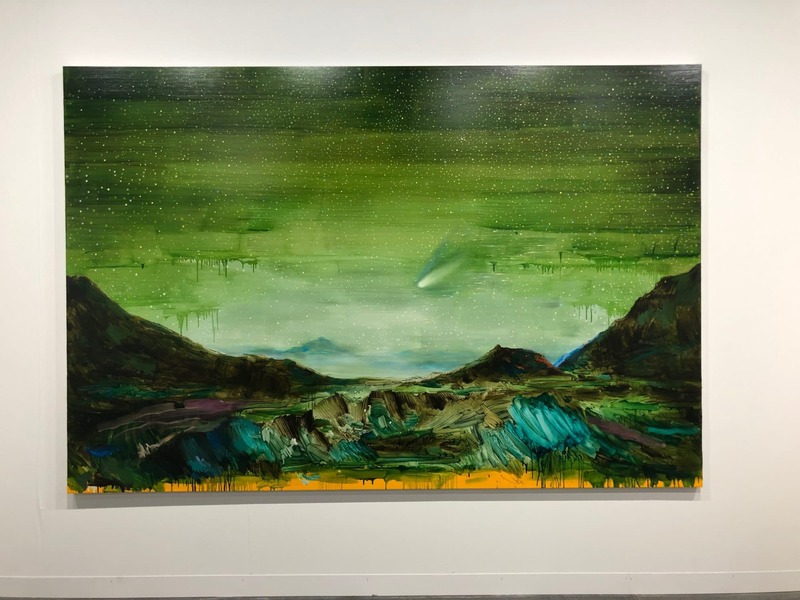 His large scale paintings—which utilize wide, open brushstrokes and combine rough, dry marks with vertical and horizontal drips—aim to deny any poetic sensibility to the harsh scenes they often depict. 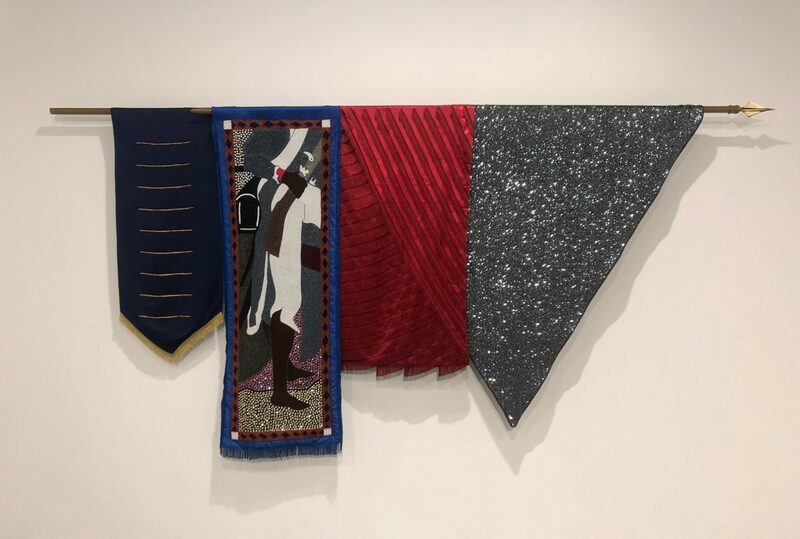 Kapwani Kiwanga, “Nations: Vertières, 1803”, 2018, embroidered fabrics, sequins and pearls, metal bar at Galerie Jérôme Poggi. From the series, “Nations”, that was conceived for the fair, Kapwani Kiwanga’s work reflects on the links between spiritual belief and politics. Kiwanga develops this reflection around Haitian vodou, and its syncretic nature. Using ancestral beadwork technics perpetuated by Haitian craft women who collaborated to the project, the sculptural installations consist of embroidered and superimposed fabrics, creating hybrid forms in-between paintings, religious banners or national flags. Pierre Bergian “Le Gran Tableau”, 2018, oil on panel, 19″ x 23″ at Purdy Hicks Gallery, London. Bergian’s paintings are always a favorite. His work looks at rooms and spaces that are often almost empty. He is intrigued by the many old, abandoned houses he encountered as a child in Belgium. His interiors are often filled with art whether they are hung on the walls or piled against and easel on the floor, often depicted as no more than a square shade of color on the wall. 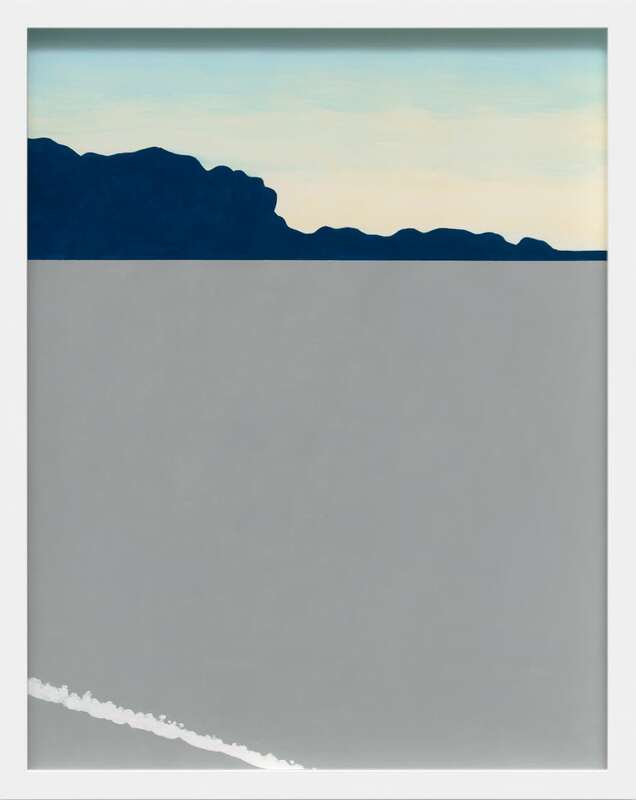 Nobuyuki Takahashi “Untitled VII”, 2018, acrylic on paper at Rena Bransten Gallery, San Francisco. Japanese artist, Nobuyuki Takahashi is inspired by scenes from his everyday life. Takahashi’s careful observation of place is distilled from an undulating world a quiet sense of equilibrium. 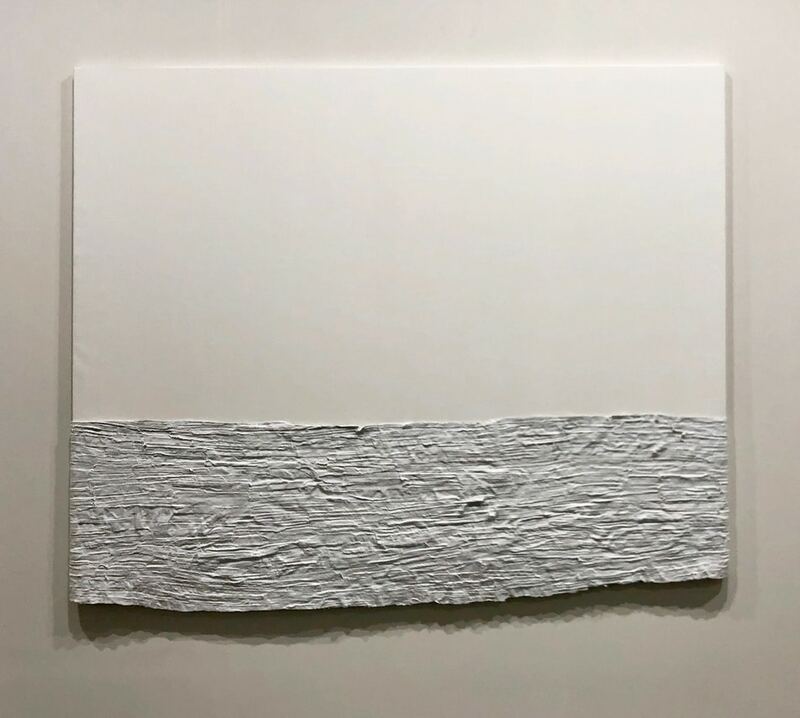 Through a multi-iterative process, Takahashi extracts the essence of his surrounding environment which results in a deceptively simple rendering of “light, depth, and reality,” imbued with a sense of serenity and contemplation. Louise Blyton, installation of acrylic on linen sculptural paintings at Joshua Liner Gallery. 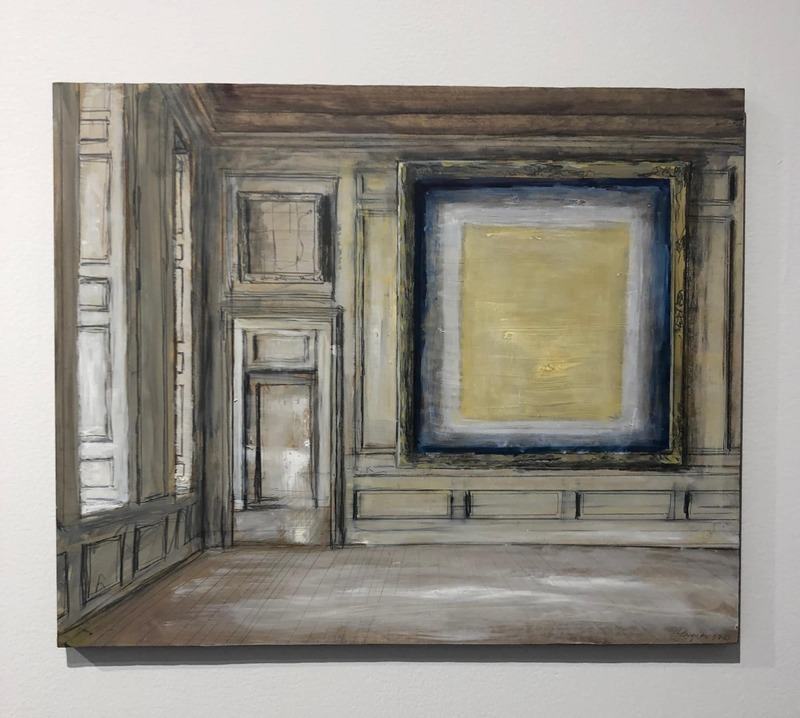 Louise Blyton creates three-dimensional paintings that interact with the architecture of the gallery space. By manipulating the shape of the traditional canvas, the Melbourne-based artist, conceives her own spatial dimension, confusing the standard relationship paintings have to any standard white wall. Some works appear to climb the surface of the walls, while others straddle columns and corners, interrupting the flow of the white cube. To create these works, Blyton stretches raw linen over custom supports and adds coats of dense pristine acrylic paint or layers of pigment. From afar, these constructions appear robust with clean planes of color, however, up-close there is evidence of the artist’s hand in the subtle shifting satin and low gloss finishes. 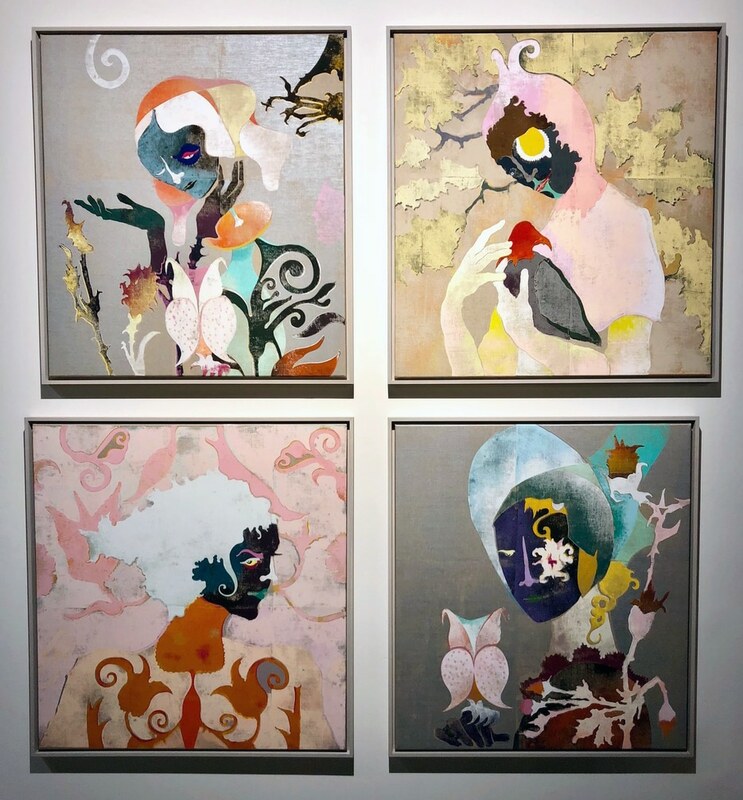 Daniel Handal, “Pajaritos”, archival ink prints with matching painted frames at Clampart, New York. 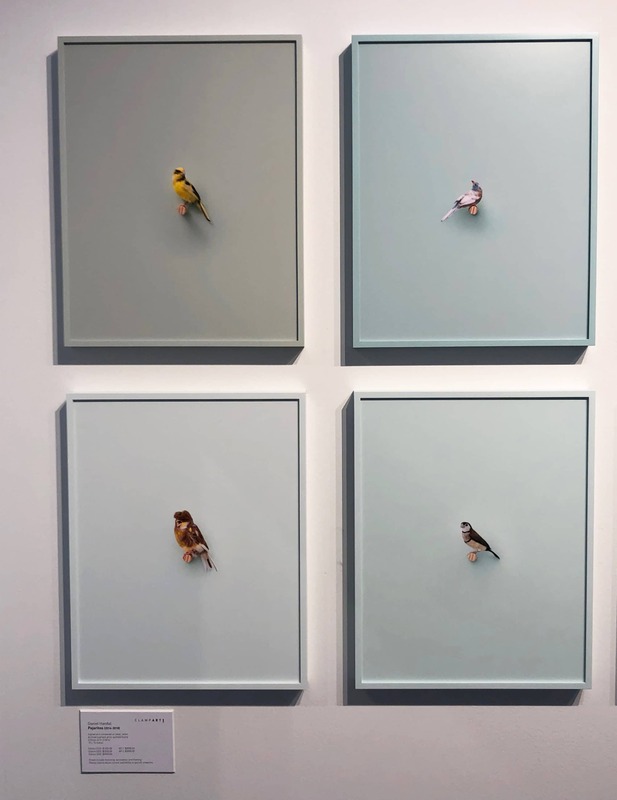 Daniel Handal presented a chromatic installation of photographs of exotic birds “pajaritos”. He found exotic bird keepers in New York City, traveled to their homes with a portable studio with a variety of pastel-colored backdrops that included a place for a perch. The portraits are then printed at 19″ x 15″ each with the bird represented life-sized to scale. 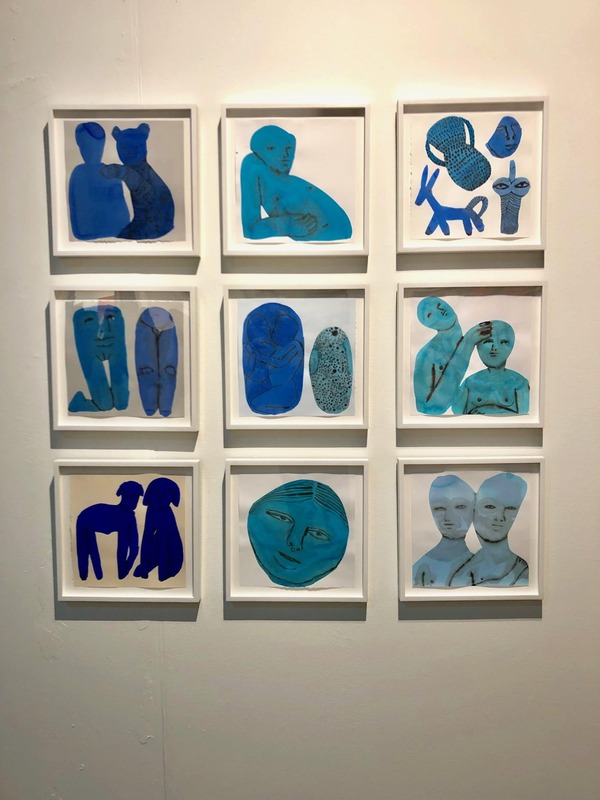 Emma Kohlmann, installation of Blue Interior Series, watercolor and Sumi ink at Jack Hanley Gallery, New York. This installation is a small selection of Kohlmann’s fluid paintings drawn from ancient statues and figurines or mythological narratives. Grouped by color and arranged in a grid these watercolors evoke a cache of symbols like hieroglyphics. 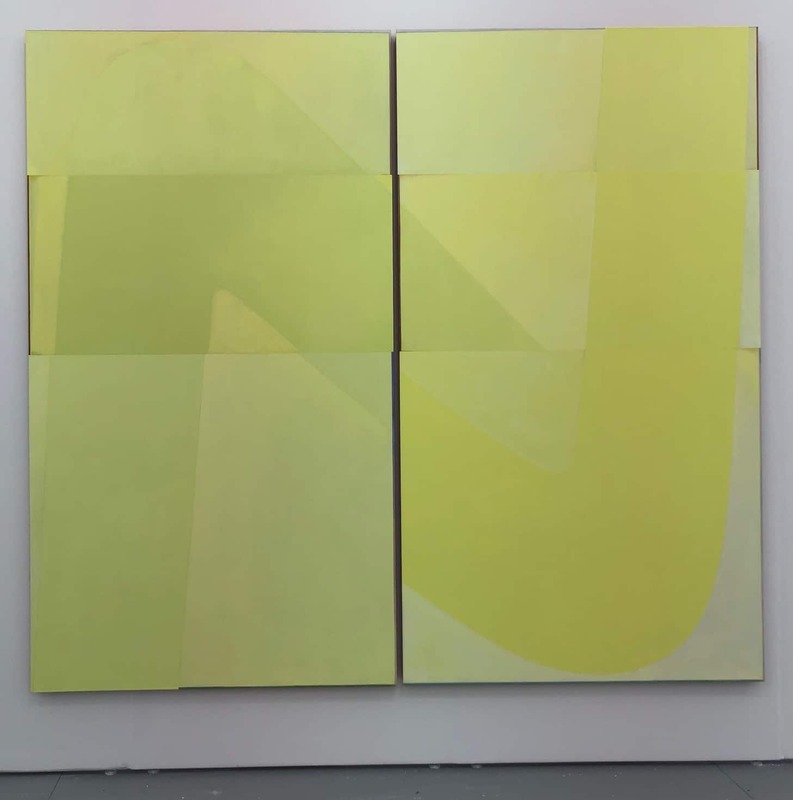 Emanuel Seitz, Untitled, acrylic paint on canvas 76″ x 51″ at Jacky Strenz, Frankfurt. These striking large-scale paintings by Emanuel Seitz are made in constant movement by first sketching out a shape, then repeating the shape over and over to fill in the composition. The result presents a strong command over color and geometry. Andy Woll “Sportville II” oil on linen, 96″ x 66″ at Night Gallery. New work by Andy Woll with the horse as subject matter shows his skill in color composition and painting techniques. Solo booth by Henrik Eiben at Galerie Christian Lethert, Koln. 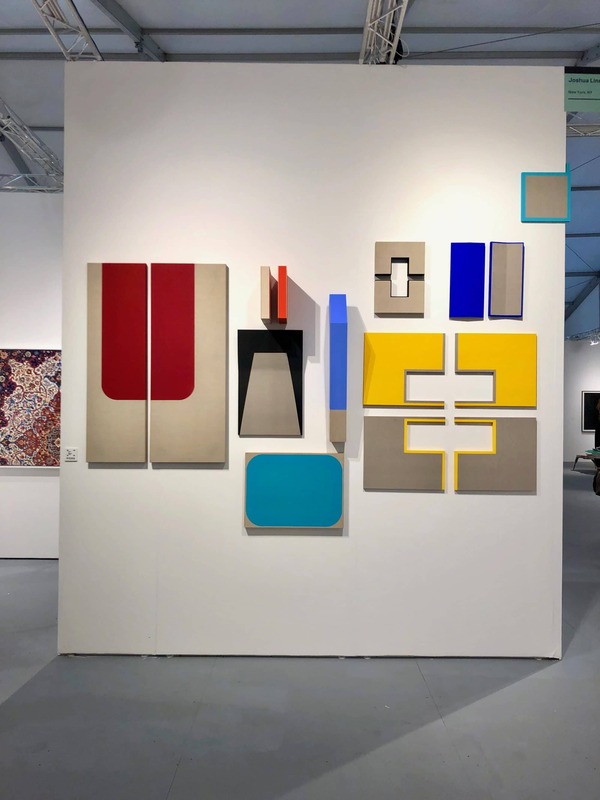 This year Galerie Christian Lethert presented a solo booth by artist Henrik Eiben and we loved everything in it. The work included watercolors, wall sculpture made of steel, glass and wood as well as constructed canvases made of plexiglas, fabric and wood. 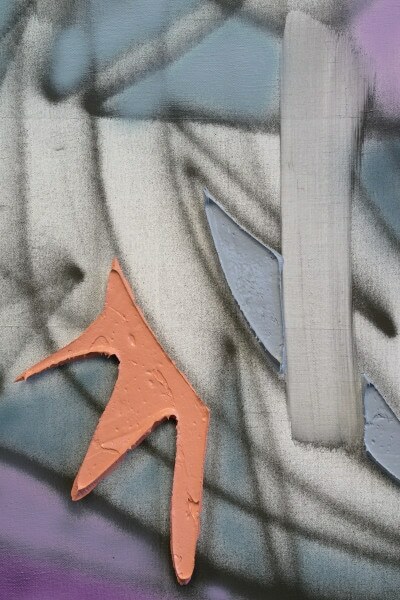 The works together really show his sensitivity to shapes, colors and materials. 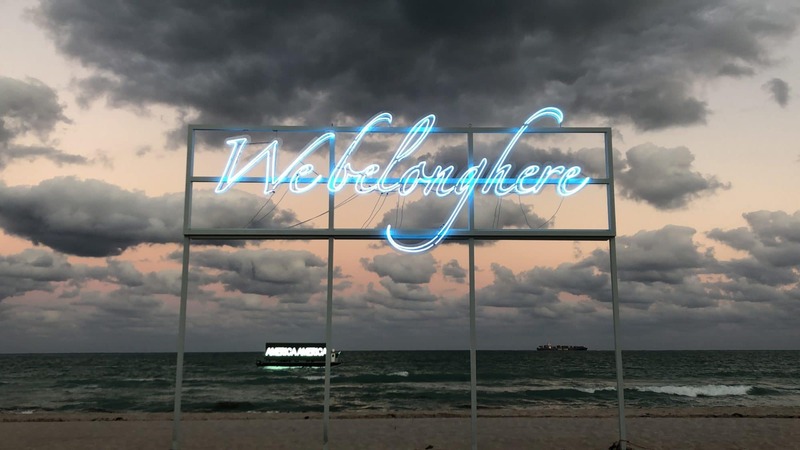 Tavares Strachan, “We Belong Here”, 2018, sky blue neon, transformers and acrylic and Alfredo Jaar “This is not America” 1987/2018 digital billboard on floating barge. Site- specific installations for the Faena Festival. Alicja Kwade At 303 Gallery, New York. Alicja Kwade has long been engaged with value systems, and with attempting to examine (if not resolve) issues of inherently subjective concepts such as space and time. In her sculptures (as well as installations, photographs and films), Kwade occupies herself with the structural properties of everyday objects. Common materials of little to no value such as glass, wood and copper are transformed via elaborate, alchemical operations. Through these physical shifts Kwade proposes new meaning and value. Nir Hod, “The Life We Left Behind” 2017, oil paint under chromed canvas. At GAVLAK, Los Angeles. Isreali artist Nir Hod’s work investigates notions personal authenticity. The highly reflective surface of the paintings act as a mirror, bringing the view into the work. Georg Herold, “Beverly” 2017, cast aluminium, car lacquer (coral red). At CFA Gallery, Berlin. 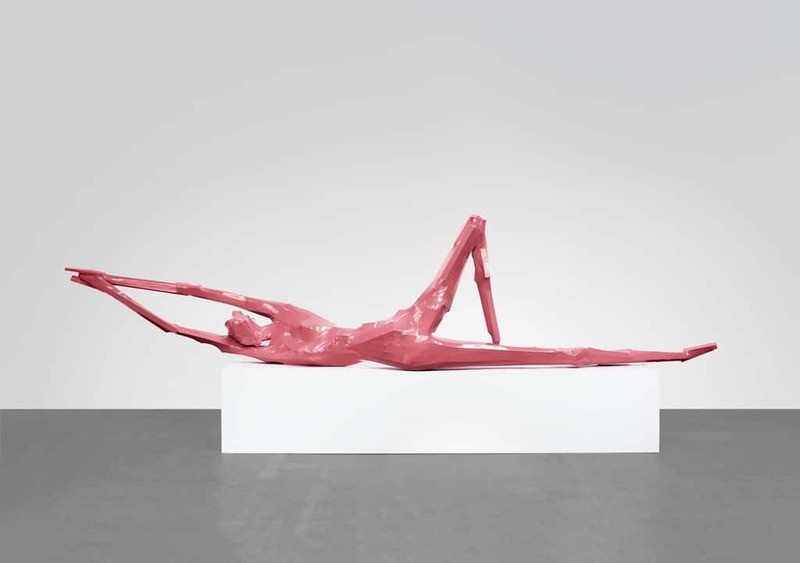 German artist Georg Herold, who studied under Sigmar Polke in the late 1970s and currently is a professor at the Kunstakademie Dusseldorf, has been creating large-scale figurative sculptures. This one is 17 feet long. Landon Metz, “Untitled” 2017, dye on canvas. At Sean Kelly Gallery, New York. 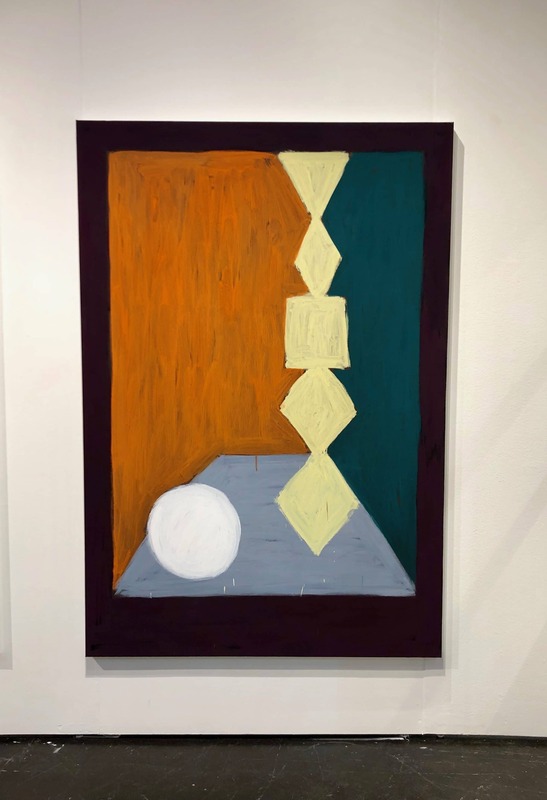 Landon Metz has garnered critical attention for his ability to imbue a spare language of abstraction with visual dynamism and sense of movement. His paintings have the capacity to expand and deal with space serially, while being site-responsive rather than site-specific. 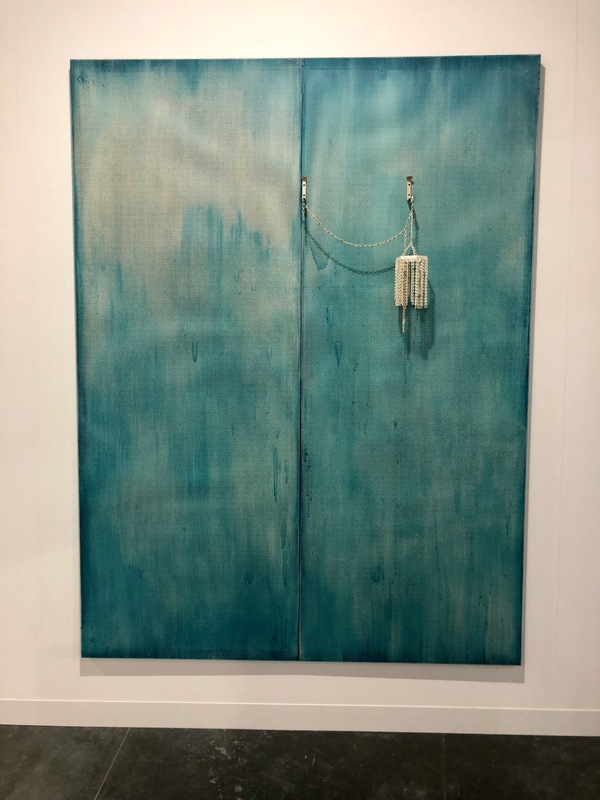 Frequently in his work, multi-panel paintings are presented as diptychs and triptychs, which he sometimes installs abutting one another, reaching into or wrapping around corners. Strategies of display are central to Metz’s visual language and his installations often incorporate elements of rhythm and repetition. Katy Cowan “(sun and moon exchange; shot sunset) Position” 2017, oil on cast aluminum. At Cherry and Martin, Los Angeles. Katy Cowan’s recent body of work investigates the terms of the art object, the identity of the maker and the site of making itself. Her pieces are formed in part by the legacy of human experience and the traces left by such experience; her objects suggest the presence of objects and ideas as both physical and metaphorical impressions. Hugh Scott-Douglas, “Triple E” 2017, UV- cured inkjet print and resin on canvas. At Blum & Poe, Los Angeles. Scott-Douglas uses FleetMon, a piece of logistics industry-specific software, which generates and subsequently captures images of the ocean’s fundamental weather patterns. Non-graphic, organic and experiential elements of the ocean—the direction of currents and winds, for example—are quantified here through graphemes. 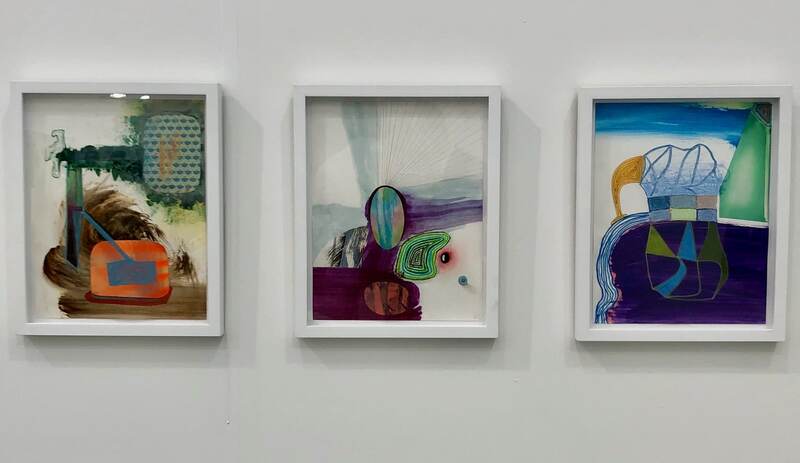 These captures are manipulated, both materially and chromatically, and then printed digitally in a manner that echoes the analog process of screen-printing. Sergej Jensen At Regen Projects, Los Angeles. 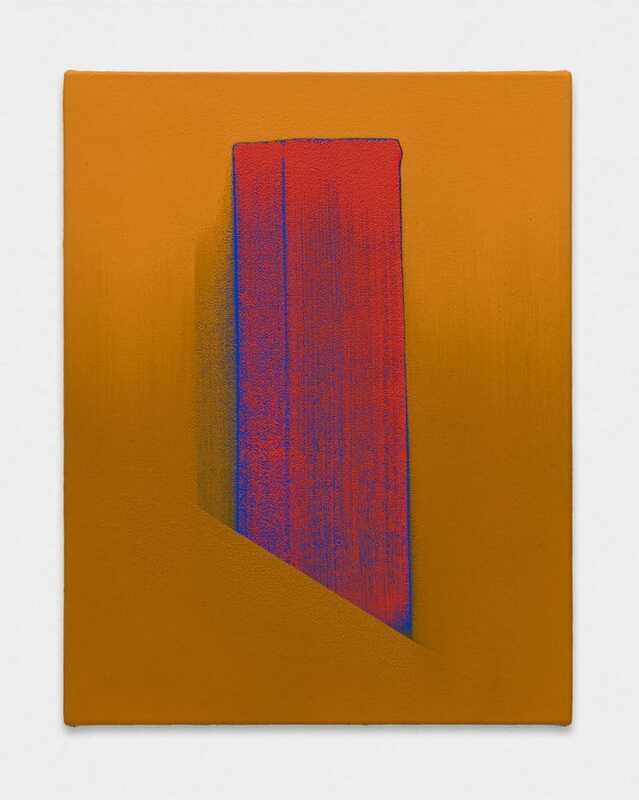 Berlin-based Danish artist Sergej Jenson is known for his minimalistic works, in which non- painterly materials and textile supports are employed as the main subject. Jensen takes the canvas and sews, bleaches, stretches or stains the cloth to create works that waver between abstraction and representation. Gert and Uwe Tobias At Galerie Rodolphe Janssen, Belgium. Twin brothers and collaborators Gert and Uwe Tobias use large-scale woodcuts to explore the intersection between popular culture and Romanian folklore. They use modernist techniques such as abstraction to cover diverse folkloric subject matter like Count Dracula, handicrafts, and peasant humor. 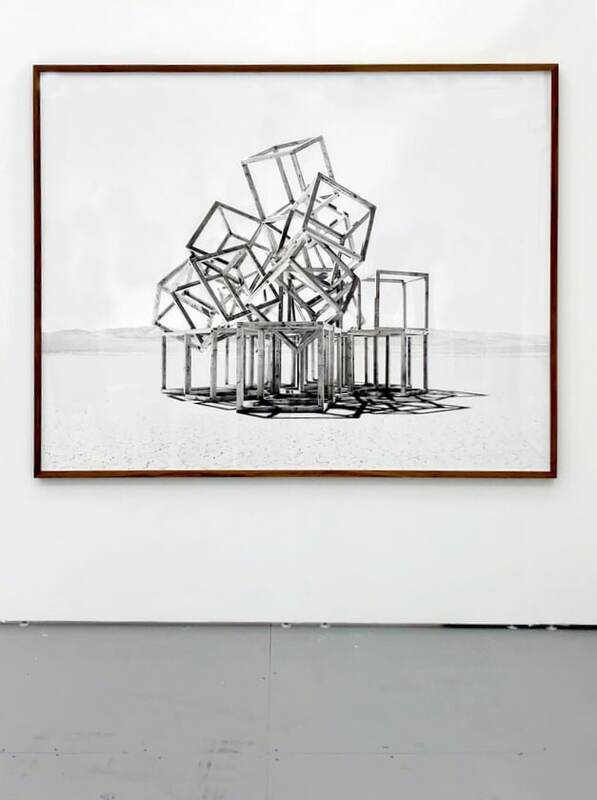 Michel François, “Fence (contamination)” 2016, aluminium, or, argent/ aluminium, gold, silver. At Galerie Kamel Mennour, Paris. Michel François demonstrates our conflicting desires to both create and destroy the world we inhabit. Striving to reveal the essential fragility of humanity, François often plays on the interactivity between the spectator, the work, and its space. Julia Dault,”Fury Road” 2017, acrylic and oil on canvas. At Marianne Boesky Gallery, New York. Julia Dault creates abstract paintings and sculptures that reveal the processes of their own making. Dault often uses unusual materials such as vinyl, silk, and spandex as the support for her paintings. 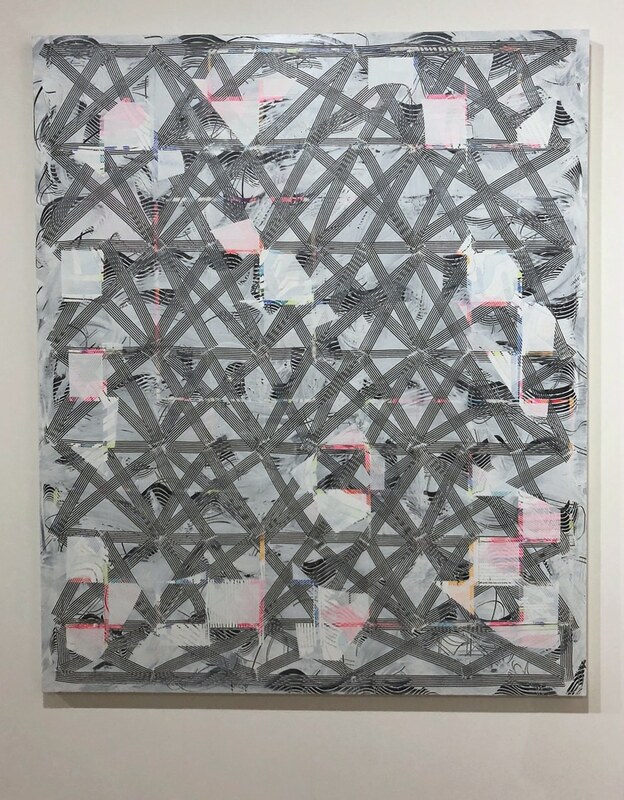 She first builds up multiple layers of paint, and then through a process of removal, exposes the underlying painting using industrial tools such as squeegees, combs, sponges, and foam blocks. 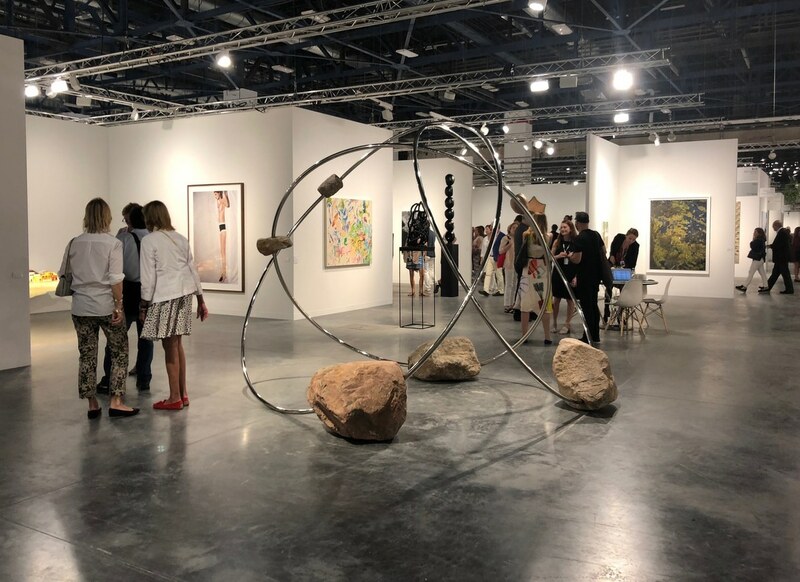 Indicative of Post-Minimalism and Conceptual art, each painting is composed with these tools as a way to set self-imposed rules that govern the making of the work. 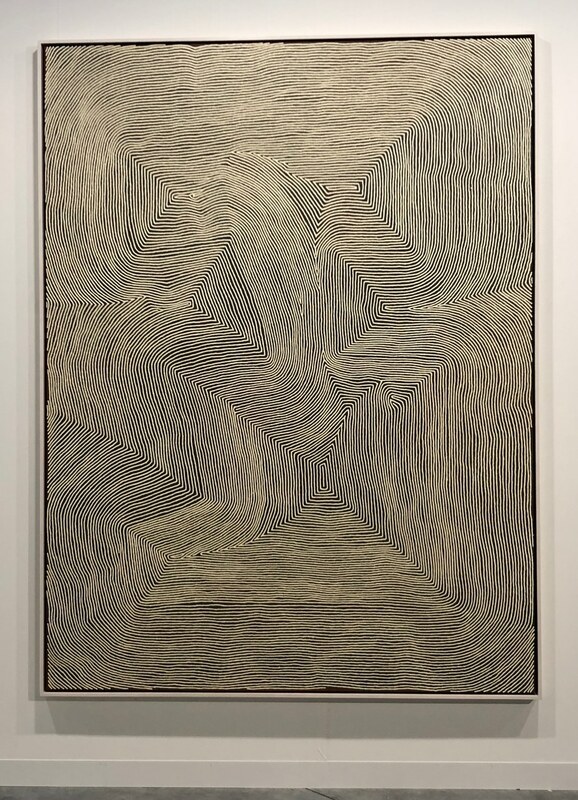 Warlimpirrnga Tjapaltjarri, “Untitled” 2015, acrylic on linen. At Salon 94, New York. Australian Aboriginal artist Warlimpirrnga Tjapaltjarri’s elaborately painted topographical patterns are created with thousands of delicate concentric lines, often depict sacred landscapes. 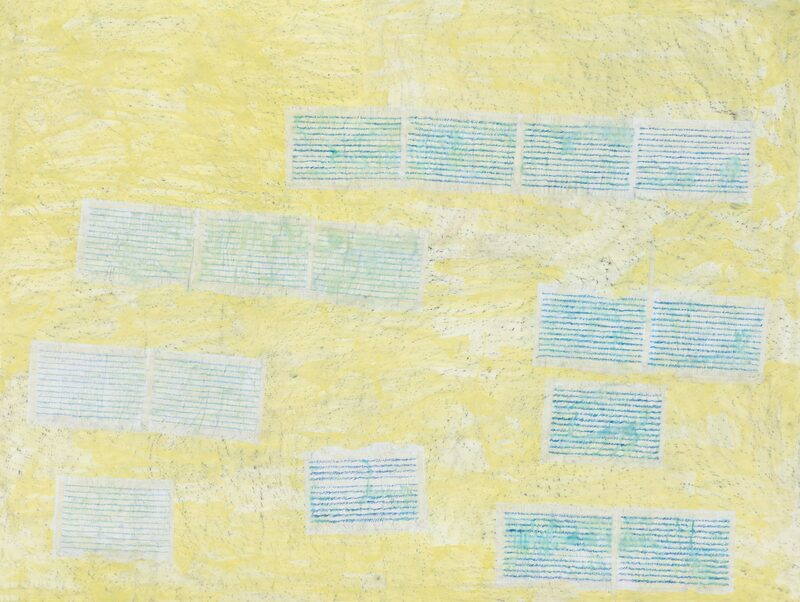 Latifa Echakhch, “Cannot remember what was the first image, and close eyes again to recover” 2014, ink on canvas. At Galerie Kamel Mennour, Paris. Born in Morocco and raised in France, Latifa Echakhch mines cultural stereotypes as subject matter for her work. By deconstructing and re-presenting materials associated with Morocco and France, Echakhch creates sharp-witted installations that challenge cultural assumptions. Moshekwa Langa, “The Love Letter III” 2016, mixed media. At Stevenson Gallery, Cape Town. Moshekwa Langa is an artist and visual anthropologist who works with installation, drawing, video and sculpture. Born in a remote town in South Africa, drawing has been an extended practice for Langa, incorporating elements of graffiti, thread, yarn and other materials. Zhou Li, “White Shadow – Lines No. 5” 2017, mixed media on canvas. At Kerlin Gallery, Dublin. Zhou Li creates lyrical abstract paintings that capture her acute sensory observations of the world: lightness and shadow, solidity and dissolution, the sense of being. 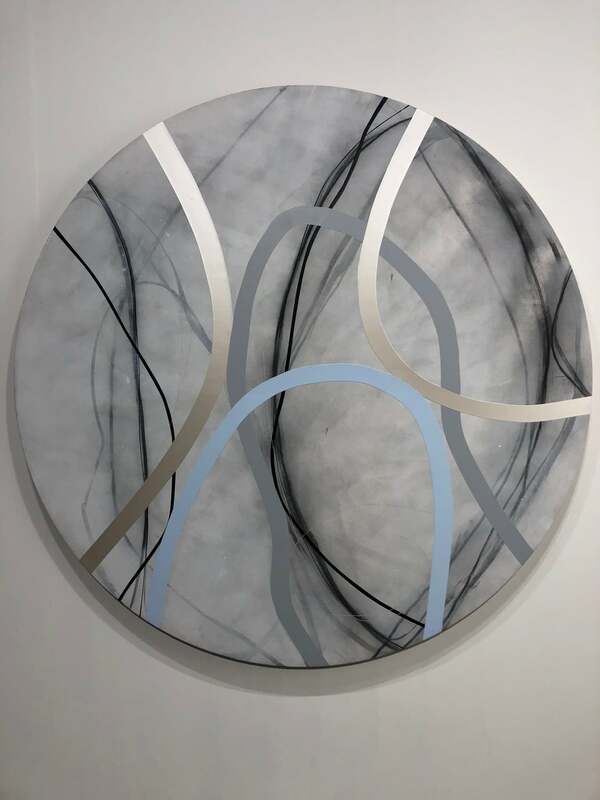 Her free-flowing charcoal lines intersect with circles of paint in a gauzy, gossamer palette; these delicate, layered forms appear to float in space and follow a complex compositional arrangement that extends beyond the surface of the painting. Elias Sime, “Tightrope: Against the Wave” 2017, reclaimed electronic components on panel. At James Cohan Gallery, New York. Ethiopian artist Elias Sime’s work achieves effects from dense narrative to austere modernist abstraction. He has a masterful handling of material, with fluency and pure formal instincts a hallmark of his practice. Firelei Baez, installation detail from Kavi Gupta, Chicago. 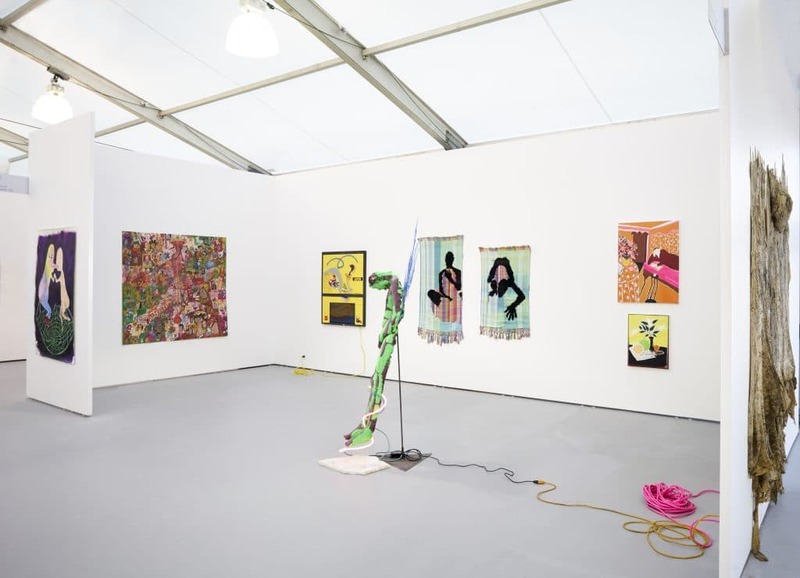 Kavi Gupta’s booth featured a separate room installation by artist Firelei Baez based on her exhibit Bloodlines. 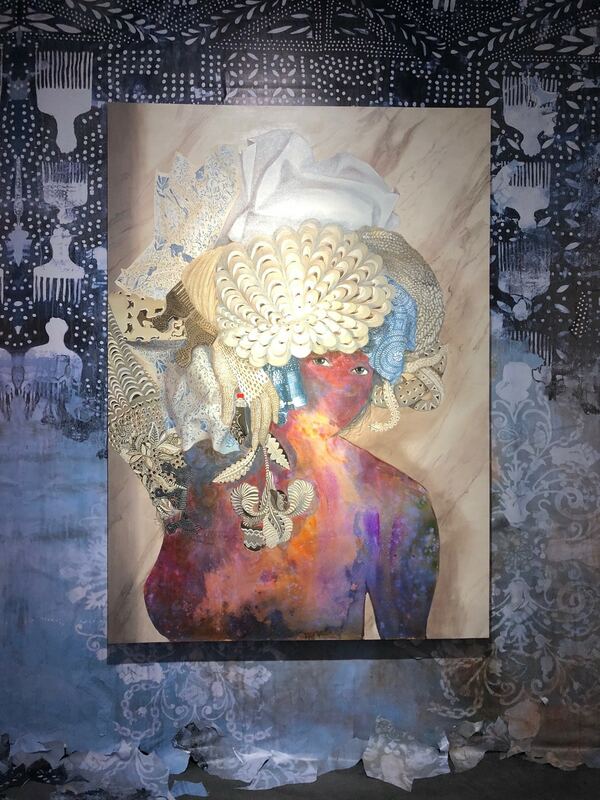 The exhibit was originally presented at the PAMM and showcased paintings and drawings depicting textiles, hair designs, and body ornaments, linking symbols of power with human gestures. 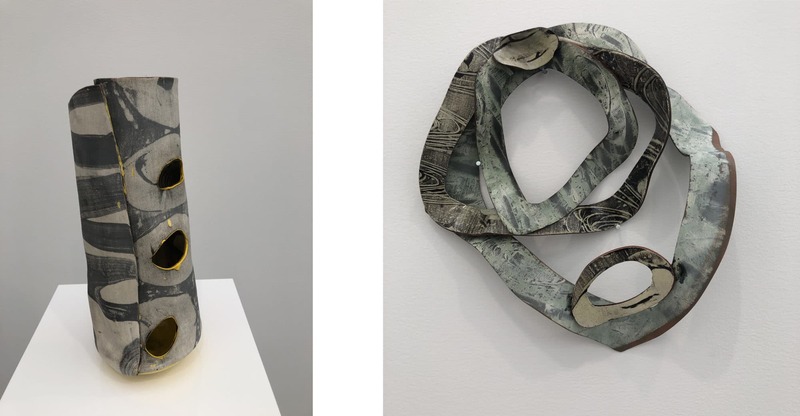 Collaborative booth of Brie Ruais (ceramic) and Thomas Fougeirol (paintings) at Albertz Benda Gallery, New York. 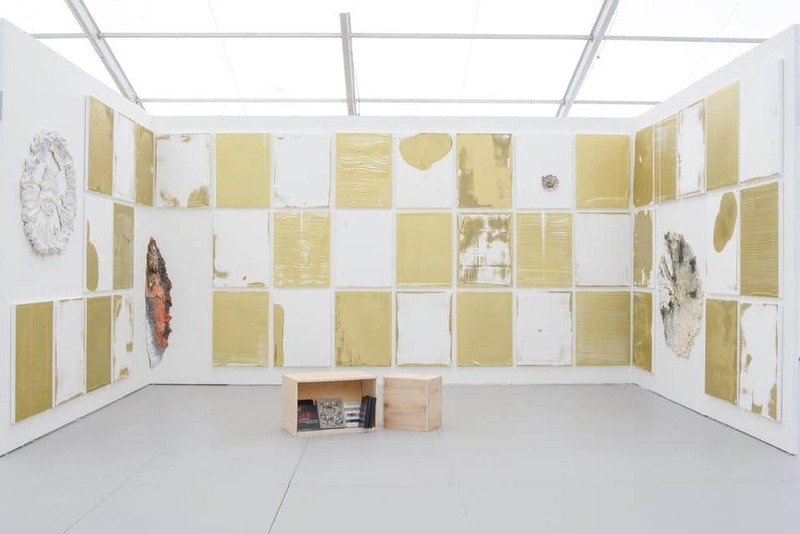 Albertz Benda Gallery showed a site-specific installation by Thomas Fougeirol and Brie Ruais in their booth. 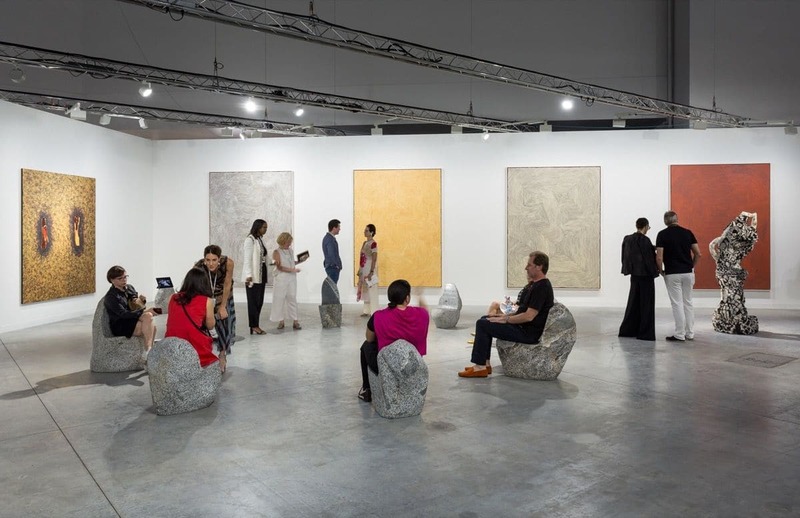 Fougeirol reimagines act of painting by removing the presence of the artist’s hand, instead inﬂuencing the composition on the canvas through the intermediary of imprints – craters left by raindrops, fabric, dust and debris on meticulously primed surfaces. Ruais works are the outcome of an intersection between performance, sculpture, and painting. While Fougeirol emphasizes the absence of the artist’s direct touch, Ruais does just the opposite; the pieces bear impressions of her toes, ﬁngers, and limbs. 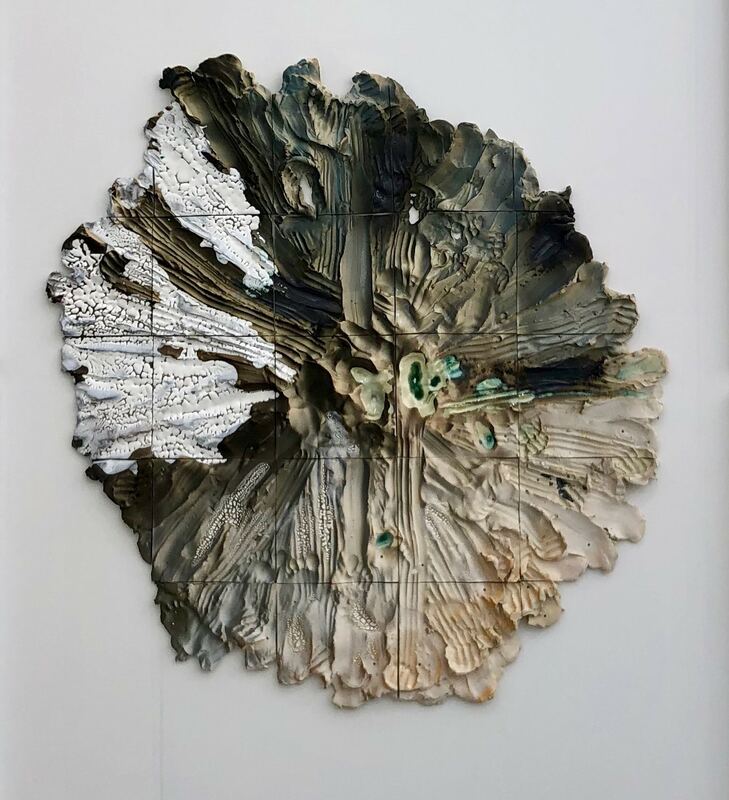 Brie Ruais merged the movements and weight of her body with hunks of clay into abstract, organic forms that serve as records of her actions. Her pieces recall landscapes, abstract paintings, and the contours of the body itself. 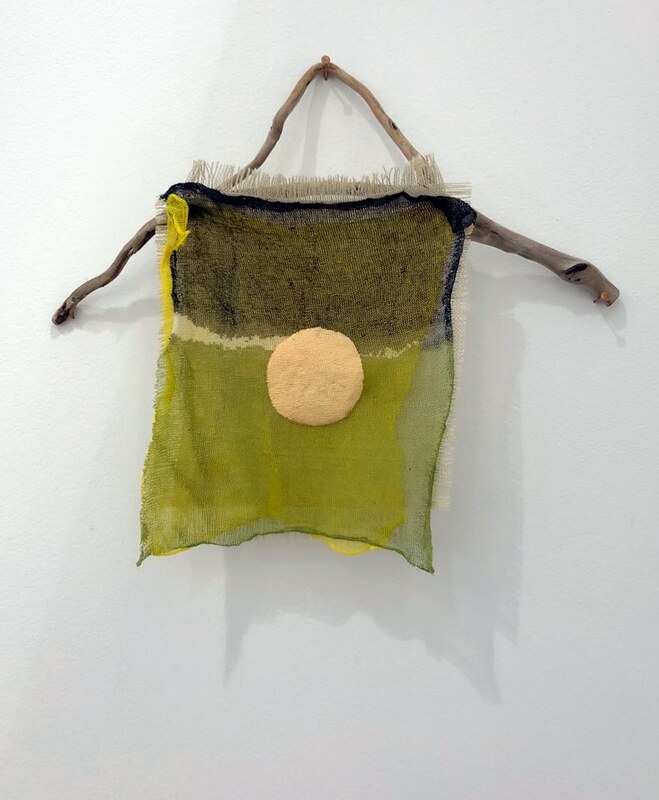 Sol Pipkin, “Luna” 2017, gauze, acrylic paint, brand, copper nail. At Zmud Gallery, Buenos Aires. Argentinian artist Sol Pipkin works with the fragility of forms and materials, creating abstract drawings and sculptures. Installation view of the Steve Turner Gallery, Los Angeles. 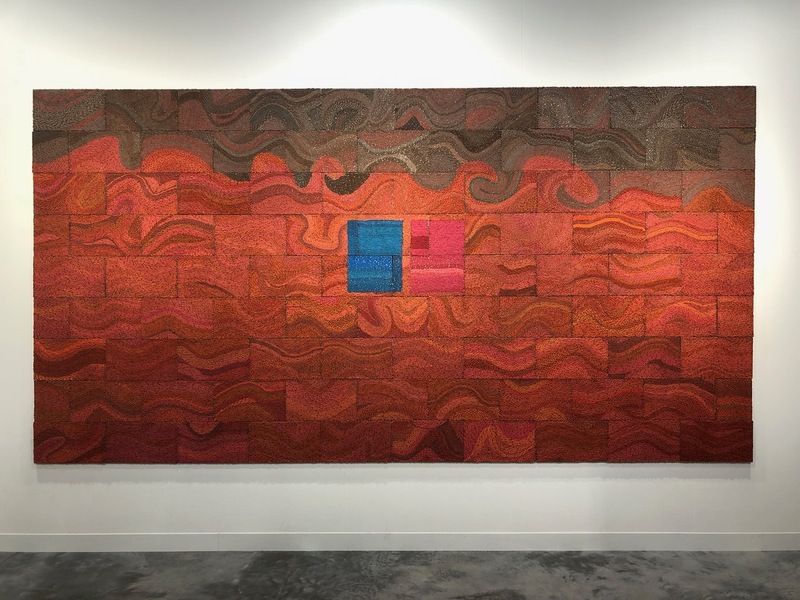 Diedrick Brackens textiles at Steve Turner Gallery, Los Angeles. Diedrick Brackens makes weavings that incorporate techniques drawn from European tapestries, West African weavings, and Southern quilts. Brackens has worked through political protest and personal pain in creating compositions that incorporate joy, pleasure, and imagination. 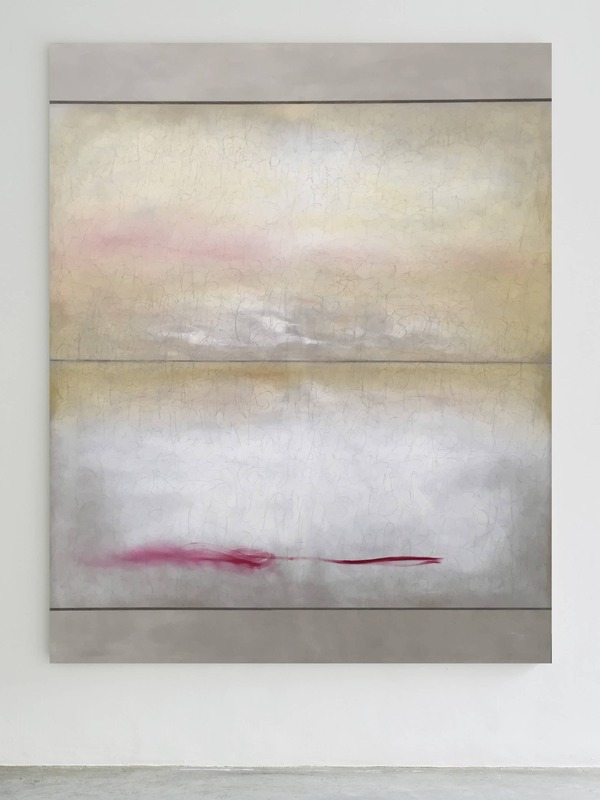 Richard Höglund, “Sea Picture CXI” 2017, gold, silver, lead, quinacridone, aureolin, linseed oil, bone pulver, marble dust and acrylic emulsions on linen. At Ronchini Gallery, London. Richard Höglund works’ use language and mark making as a starting point, turning linear form into melodic abstract compositions through the use of particular materials such as microscopic shells collected on the banks of the Mississippi River, marble dust and pulverised bone. 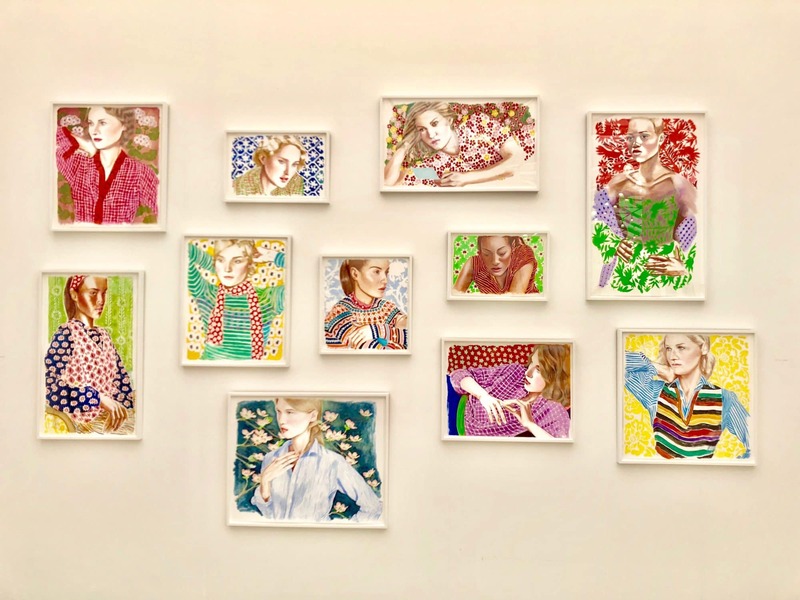 Installation of Jocelyn Hobbie paintings at Fredericks and Freiser Gallery, New York. Jocelyn Hobbie paints flawlessly articulated paintings of imaginary women. She has fused themes of mortality, eroticism and the persistent disaffection of contemporary life. Hobbie has honed a formal inventiveness in which neoclassical figures with pensive expressions are depicted amid bold and striking patterns. 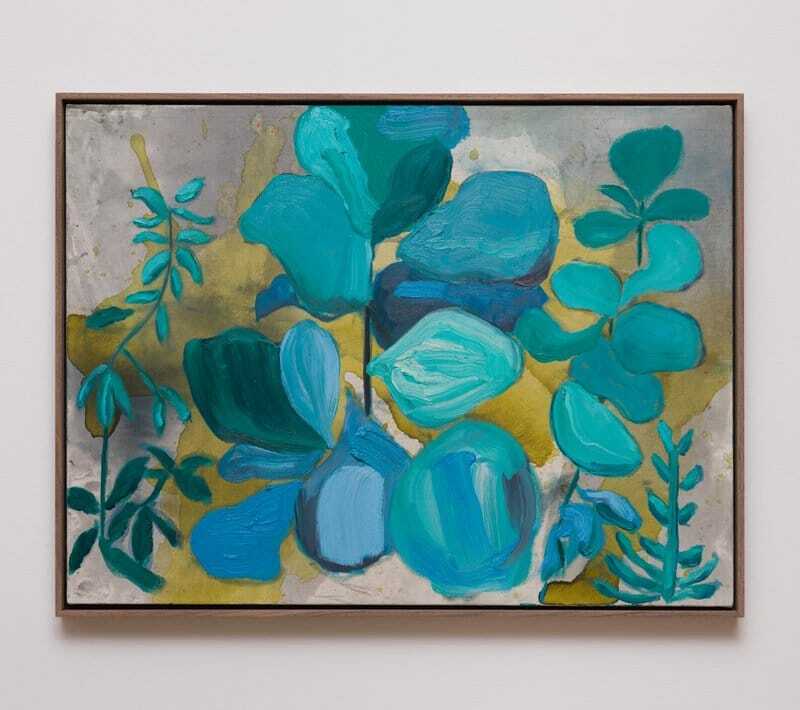 Her heightened naturalism and enhanced degree of saturated color reveal an uneasy relationship to realism and firmly root these unusually psychological paintings in the age of post abstraction. Natasza Niedziolka, “Zero 1627” 2016, embroidery on canvas. At C. Sean Horton Gallery, New York. Interweaving modernism, folk tradition, and arts & crafts, Natasza Niedziolka knits and embroiders large works filled with bold colors and shapes. 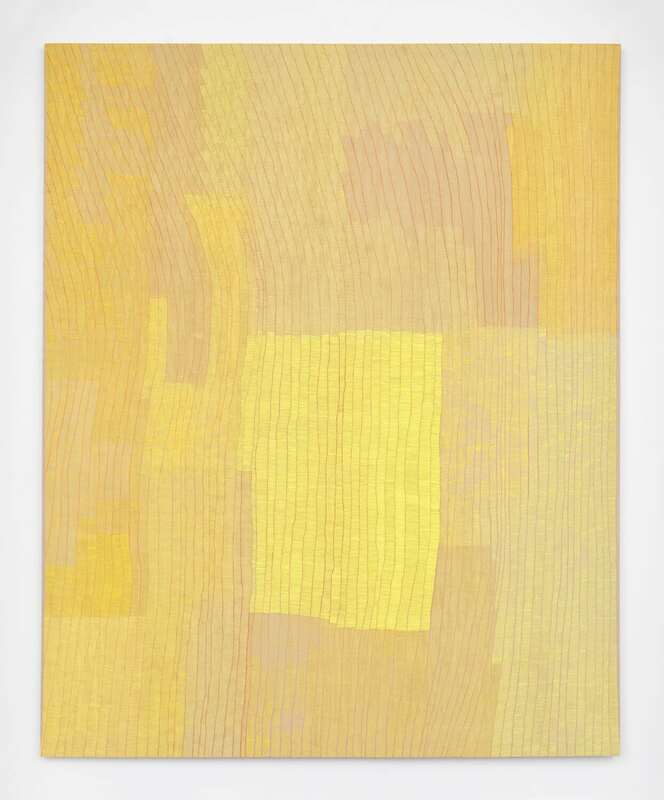 While her techniques are traditional and domestic, Niedziolka’s work is distinctly contemporary, merging modernist abstraction with the textile tradition. Derrick Adams, “Ebony Fashion Fair #3” 2017, mixed media collage on paper. At Vigo Gallery, London. Derrick Adams explores the force of popular culture in our lives and plays with perception in relation to objects and texts. Rooted in deconstructivist philosophies, Adams’s work focuses on the fragmentation and manipulation of structure and surface. 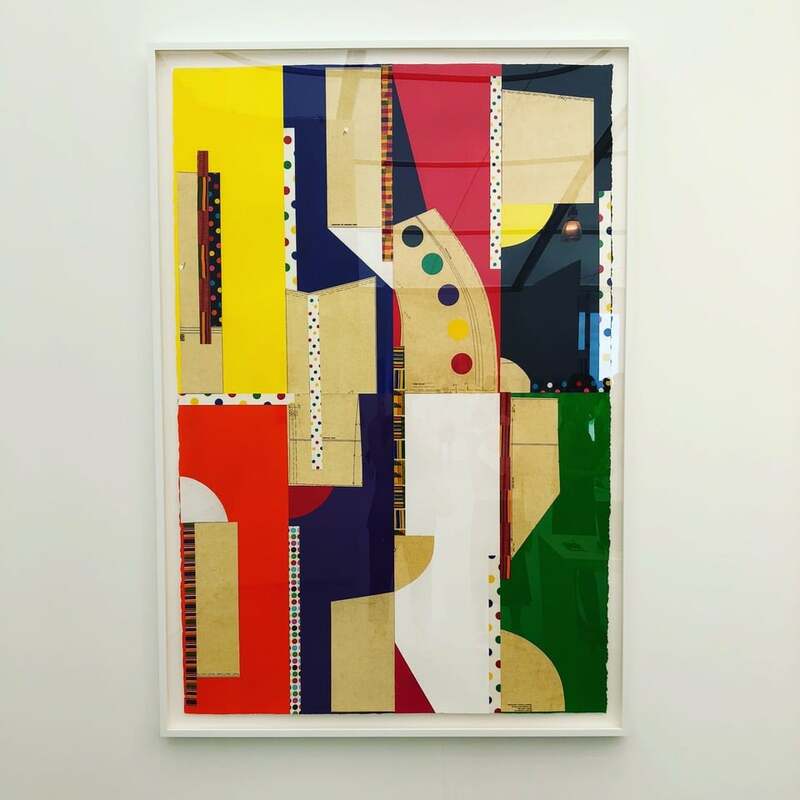 This collage is part of a new series that is based on Adams’s extensive research into the archive of the influential African-American fashion designer Patrick Kelly. 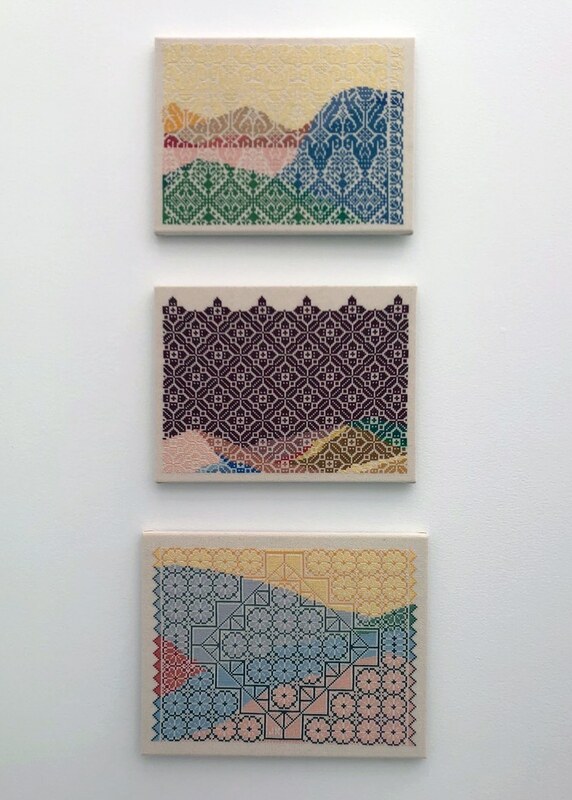 Jordan Nassar, “Jaffa 5 and 6” 2017, embroidery. At Vigo Gallery, London. Nassar’s work addresses the intersection of craft, language, history, (geo)politics, and technology. Beginning with the intricacies of identity and cultural participation, as a Palestinian-American, Nassar treats traditional craft more as medium than topic, examining subjects such as cultural heritage, ownership, exchange and absorption. 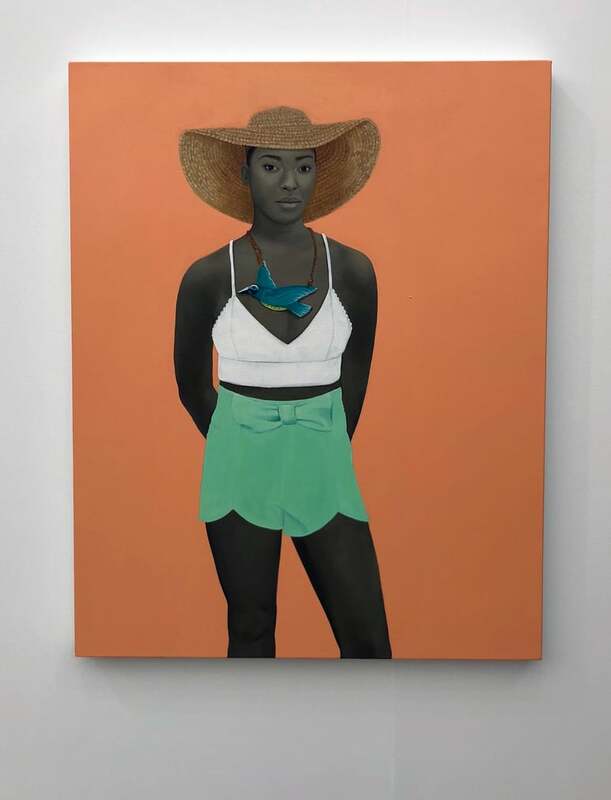 Amy Sherald, “Untitled” 2017, oil on canvas. At Monique Meloche Gallery, Chicago. Sherald employs race to explore the evolution of one’s identity as a reaction to external directives. Each portrait depicts a friend or acquaintance of the artist, suspended in vivid fashions before a non- descript background, which Sherald describes as “the amorphous personal space of my own existence within the context of black identity and my search for ways to clarify and ground it.” To add to the otherworldliness, skin tone is rendered only in shades of gray, made by mixing Naples yellow and black oil paint. Ever critical of African American cultural history and the representation of black bodies, the series is Sherald’s satirical manifestation of identities shaped by political, social, economic, and cultural influences. AMLgMATD created these special awnings for the VIP terrace. These free standing open air structures provided shade and relaxation for visitors from the harshness of the daily sun. 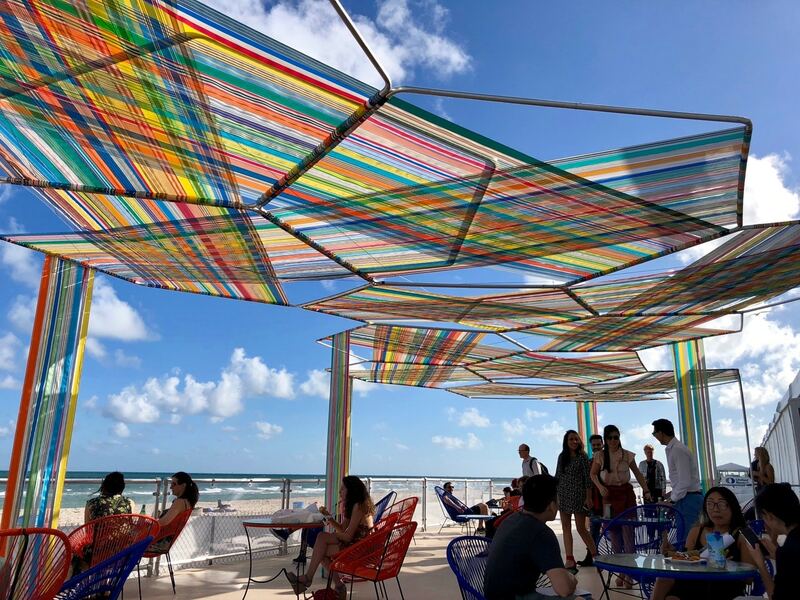 Our favorite part was that it created a stained glass effect when activated by the sun while amplifying the tropical flavors of the pavilion’s location. Marie Herwald Hermann, 2017, porcelain and latex sculpture. At Reyes Projects, Birmingham, Michigan. 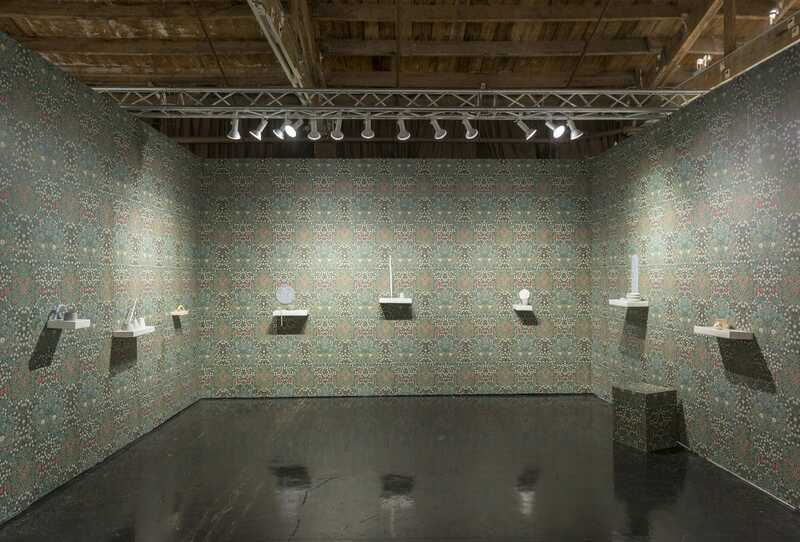 Reyes Projects chose to focus on a solo show of ceramics by the Chicago based Danish artist Marie Hermann. The works are set against the backdrop of William Morris’s Blackthorn wallpaper, a pattern built from arrangements of common English weeds that, depending on how you look at it, may or may not suggest skulls. The wallpaper, which Hermann’s grandmother had in her home, was a pivotal influence in the artist’s aesthetic education, introducing her to Morris’s “idea about objects and the joy of labor and a utopian vision of life” that she says informs her craft-inspired art to this day. Keltie Ferris, “(W(A)V)E(W(A)K)E)” 2017, oil and acrylic on canvas. At Moran Bondaroff Gallery, Los Angeles. 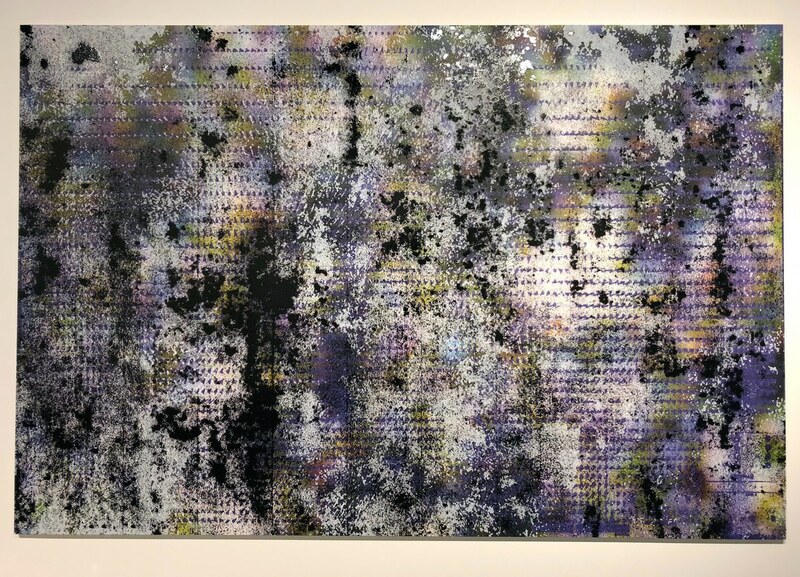 Keltie Ferris’ compositions create perceptual depth that allow for multidimensional readings of her work. Characterized by a continuously expanding investigation into painting, her practice considers a multiplanar site for constructed light and shifting space. Marc Horowitz, “Profound Boredom” 2017, inkjet print on canvas, acrylic, oil, oil stick on canvas in artist’s frame. At China Art Objects, Los Angeles. Horowitz offers a cleverly staged mash-up of art historical references and popular culture, with the affable lightness, comedic timing and understated depth for which he’s known. His paintings are gestural, funny and complex. 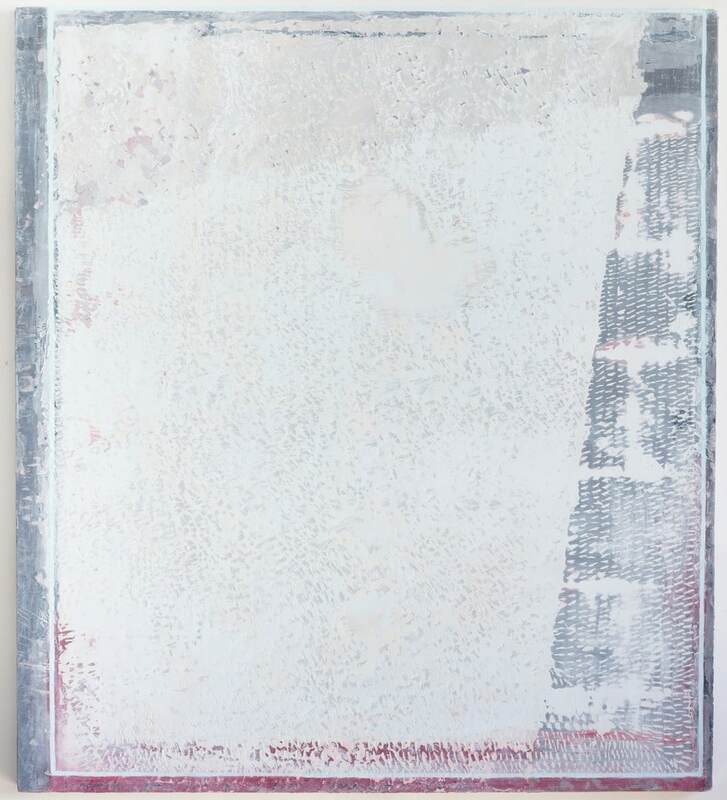 Jessica Dickinson, “This: For” 2016, oil on limestone polymer on panel. At James Fuentes Gallery, New York. 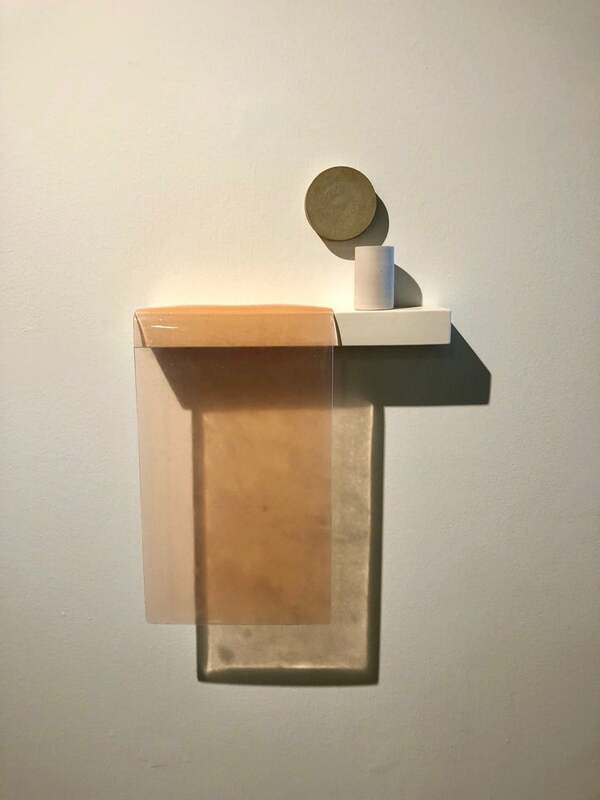 Jessica Dickinson’s work focuses on the sensations of time, light, and matter within shifting philosophical, perceptual and psychological states. Working with oil paint and various tools on a plaster-like ground, various additive and subtractive actions of countering speeds and pressures are layered, from repetitive marking to aggressive chiseling. Henna Vainio, (left) “Mask” 2017, fused glass, plaster, pigment, wire. (Right) “Spring #2” 2017, fused glass, plaster, pigment, wire. At Capital Gallery, San Francisco. Henna Vainio uses sculptural casting as a method to reproduce everyday objects often resulting in the creation of seemingly natural looking, yet unrecognizable forms. Ryan McLaughlin, (left) “Anchor Park” 2017, oil on canvas on board. (Right) “Metro” 2016, oil on canvas on board.. At Dan Gunn Gallery, Berlin. 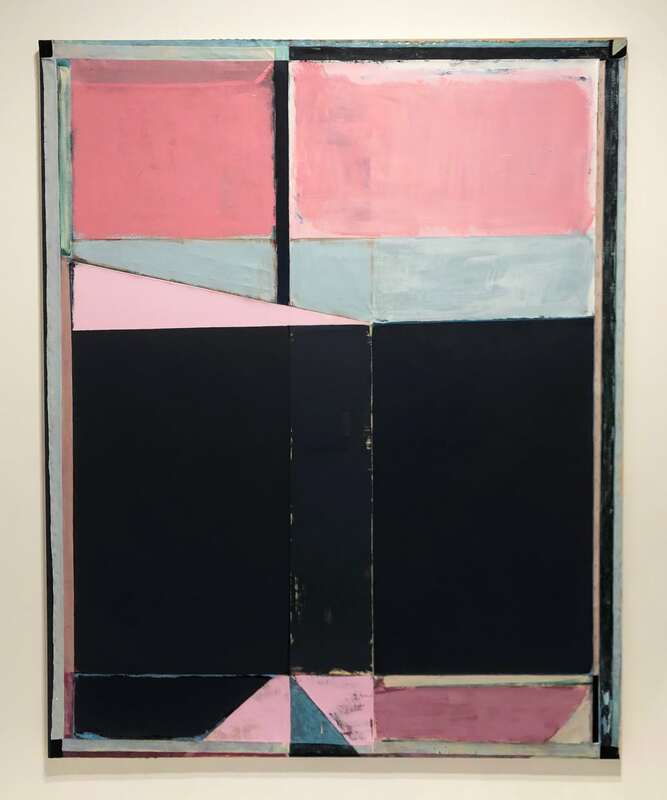 McLaughlin’s enigmatic work, conjuring the dry, flat surfaces of 1940s easel-size abstraction, incorporates fragmented pieces of text, code, and other symbols. His use of muted colors and and gentle applications seem almost childlike and playful. Alex Olson, “For Energy” 2017, oil on canvas. At Shane Campbell Gallery, Chicago. Alex Olson is known for her abstract paintings, which juxtapose patterns, shapes, textures, and colors to create disjointed visual and linguistic symbols. This piece is from a series of work referencing forms and symbols meant to heal. Irene Grau At Maus Contemporary, Birmingham, Alabama. 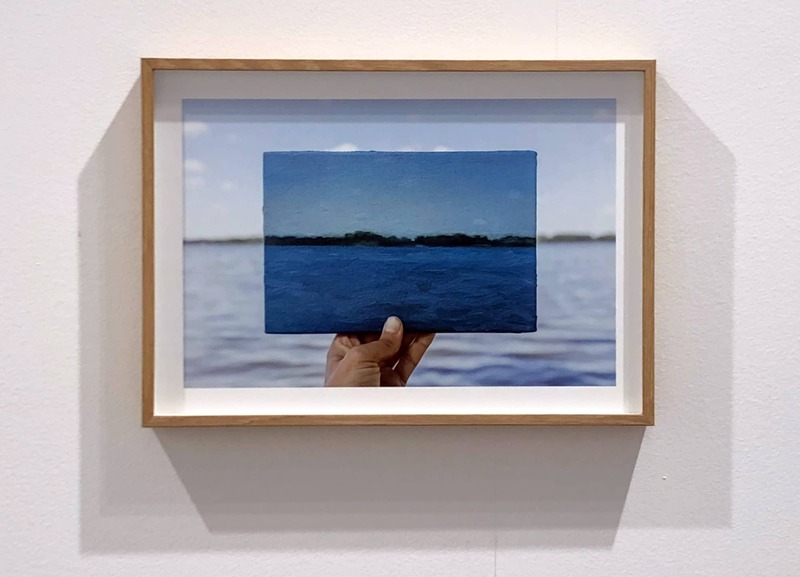 Irene Grau, “Lake Waubesa” 2017, photograph and painting. Painting: oil on canvas, photograph: UltraChrome print on Hahnemühle Photo Rag paper, mounted on dibond. At Maus Contemporary, Birmingham, Alabama. 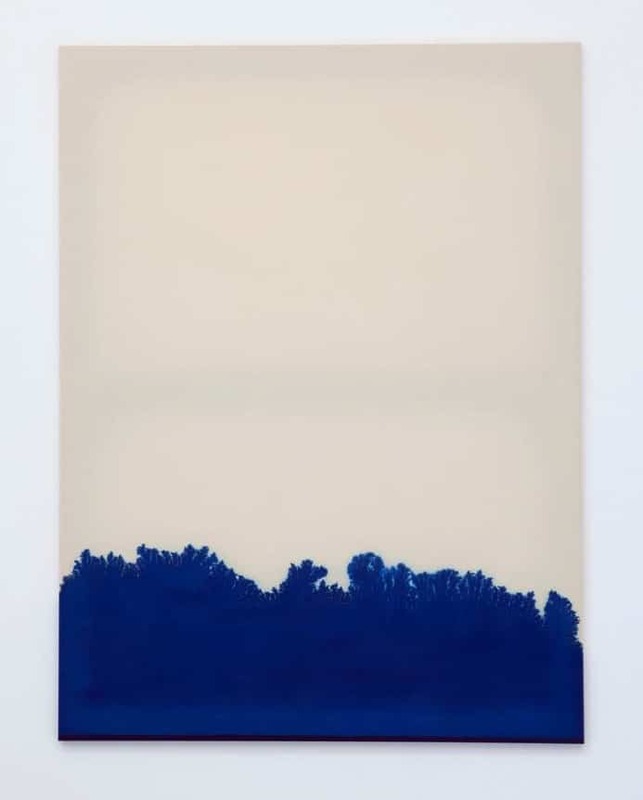 Irene Grau uses a process involves painting an oil landscape in nature, photographing it on location, and then before it dries, blurring it until you get a single uniform color. What results is a synthesis of a landscape. She then presents the photograph, along with the resulting monochromatic painting together. The viewer can then reconstruct the history of the painting. Yuh-Shioh Wong At Richard Levy Gallery, Albuquerque. 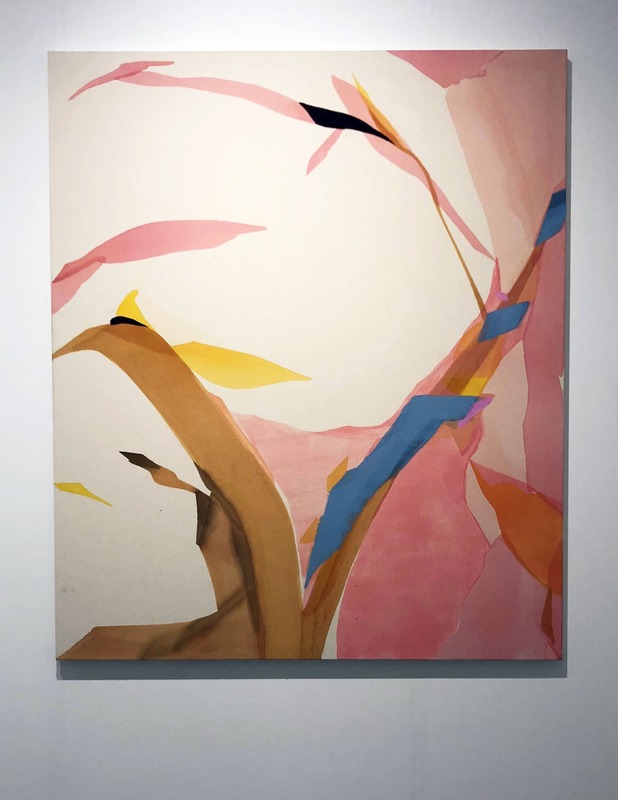 Through her intrinsic understanding of the natural world, Yuh-Shioh’s paintings communicate the inherent structure of things- through shape, color, and line- and how they connect to one another and to human experience. Many are elemental in nature, reflecting water and sky. They are portals for the viewer to experience their own spirituality and healing. Jutta Haeckel, “Twist” 2017, vinyl medium on jute. At Hosfelt Gallery, San Francisco. Jutta Haeckel’s work occupies a realm between three- dimensional reality and the endless field of imagination. There are multiple viewpoints for a each of her paintings which results in a fluid concept of space. Without a subject, the paintings offer an invitation to question our perceptions, consider new approaches, and become more open to the unknown. 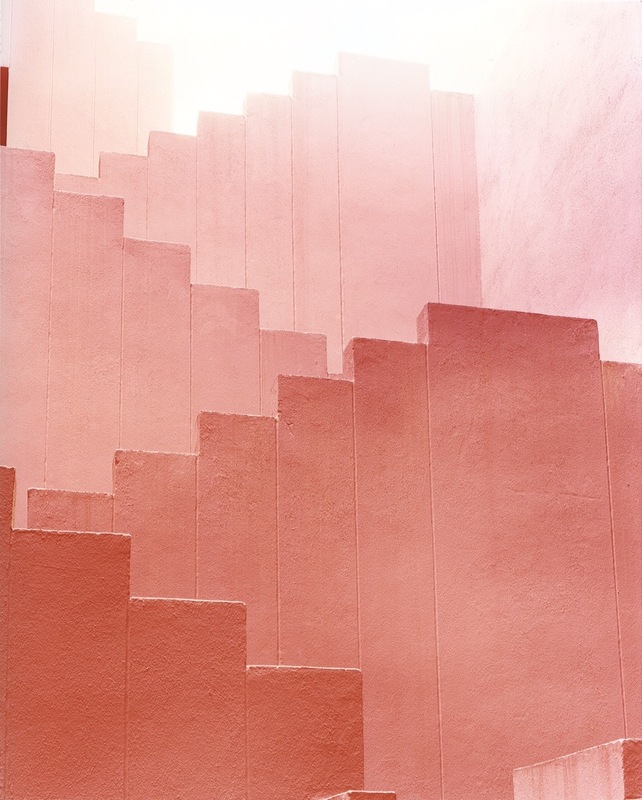 Ola Kolehmainen, “Red Staircase 2” 2012, c- print. At Purdy Hicks Gallery, London. In his monumental photographs of modern architecture, Ola Kolehmainen zeroes in on a building’s unremarkable details, reducing facades to simple forms and blocks of color evocative of abstract Minimalist paintings. Only rarely does an element of a building’s surrounding environment, such as a bird or a cloud, make its way into the frame. Mounted on shiny acrylic glass, the photographs are also notable for their glossiness.